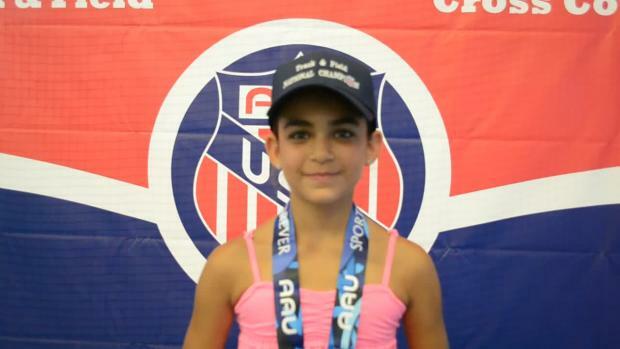 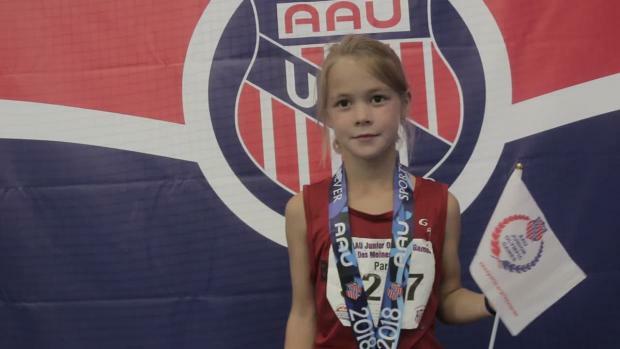 Check out the club rankings for all of the girls age groups. 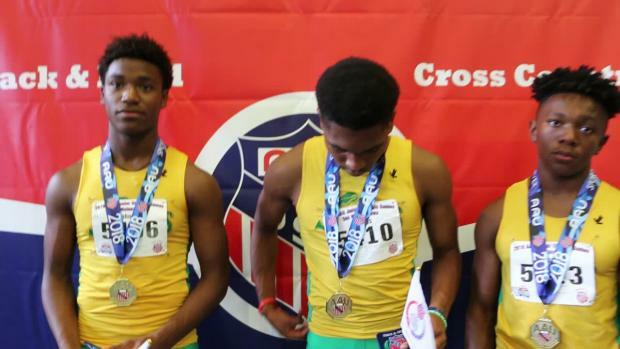 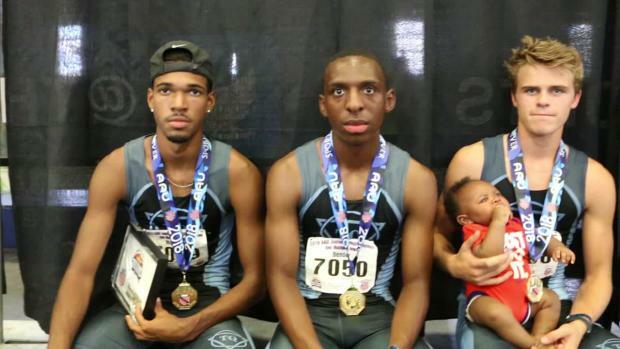 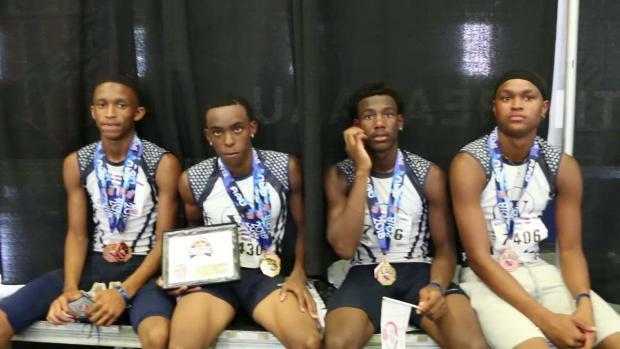 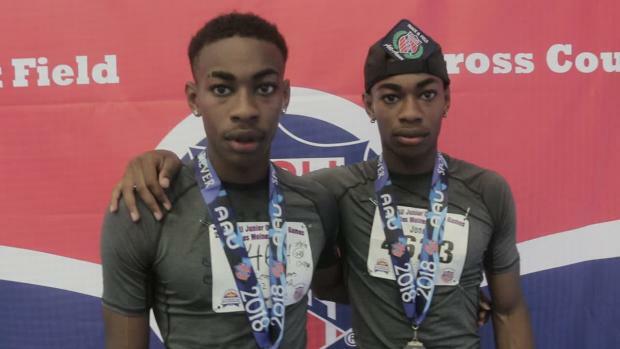 Detroit Pal set a new record time of 46.07 for the 14 year old division in the 4x100 preliminary round at the AAU Junior Olympic Games. 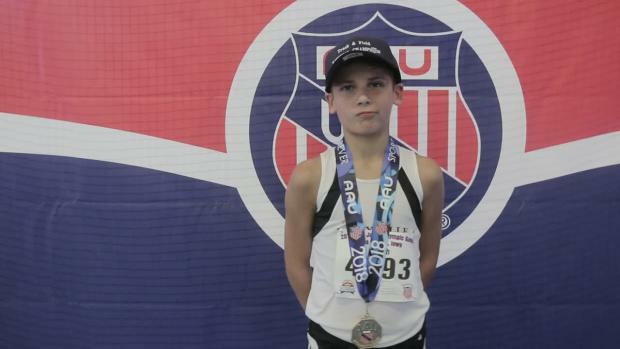 Check out the first edition of the club rankings for all of the boys age groups. 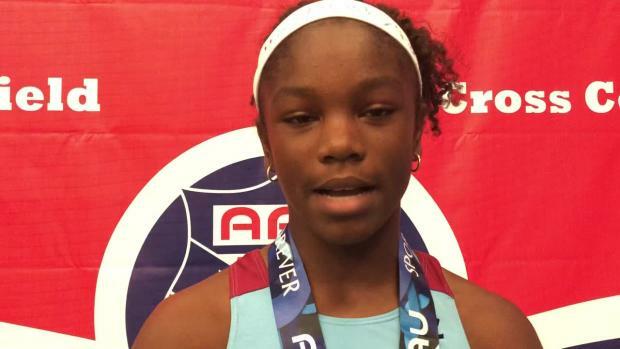 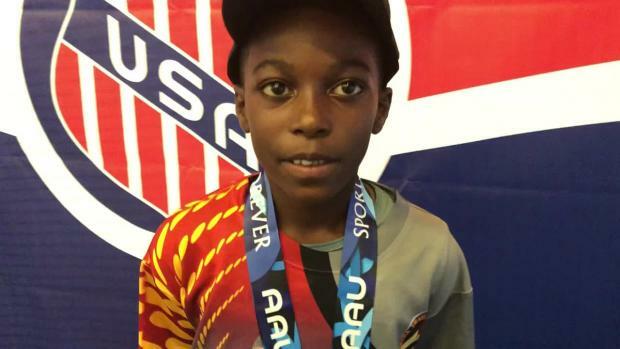 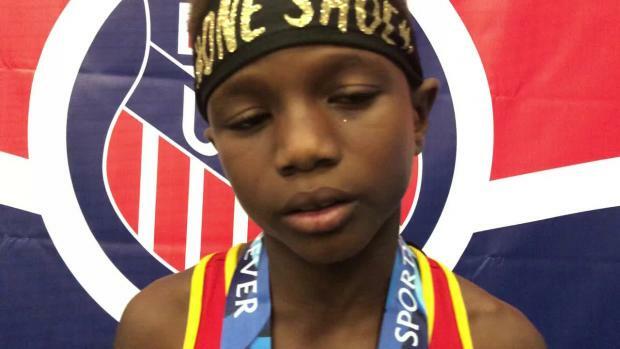 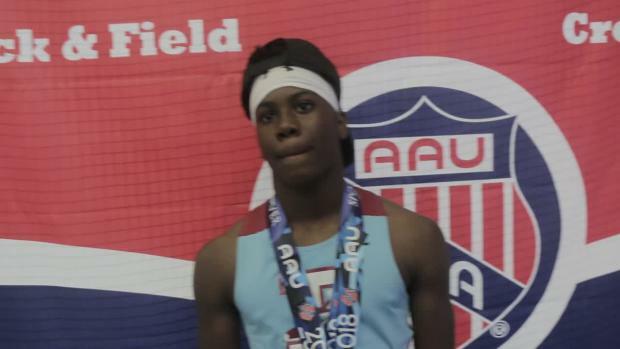 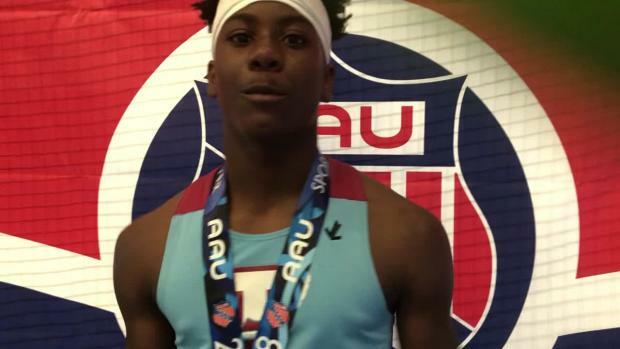 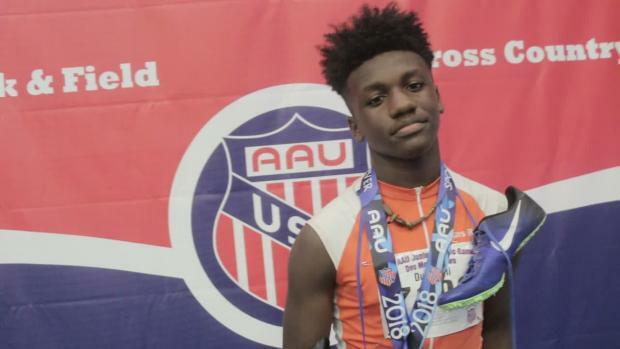 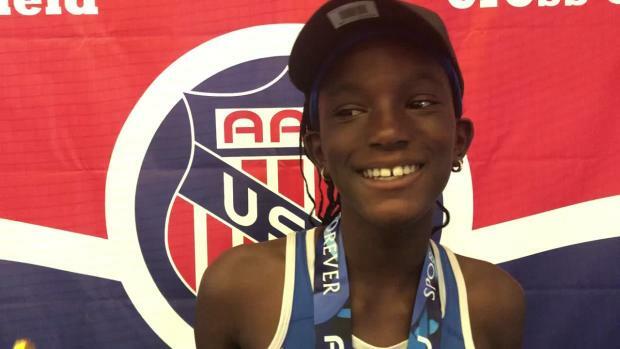 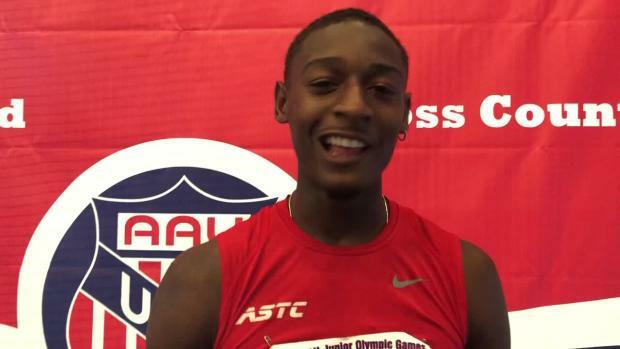 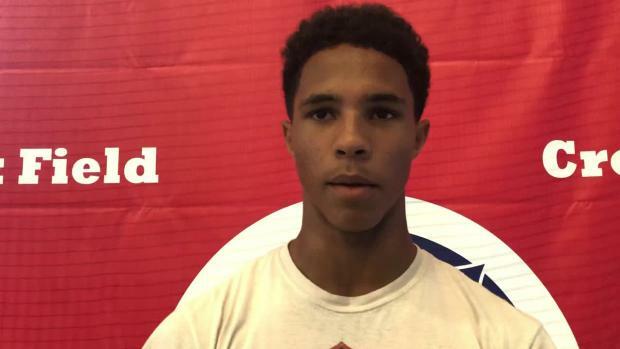 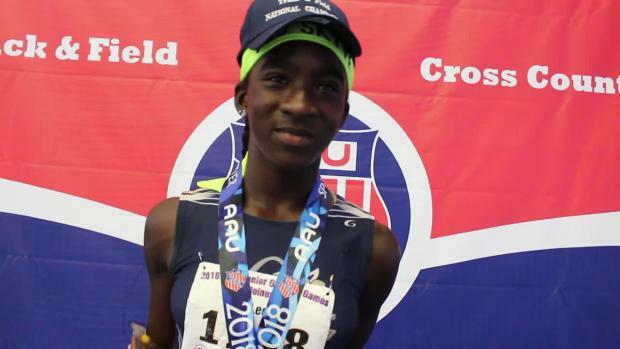 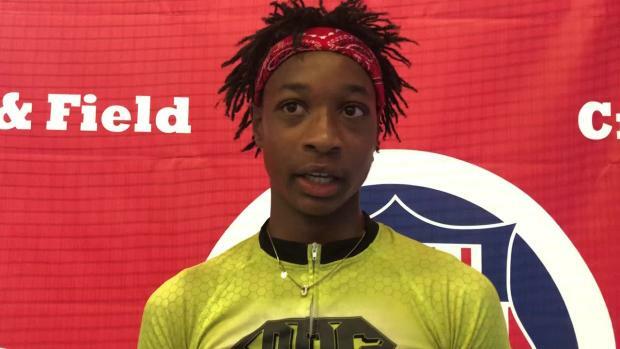 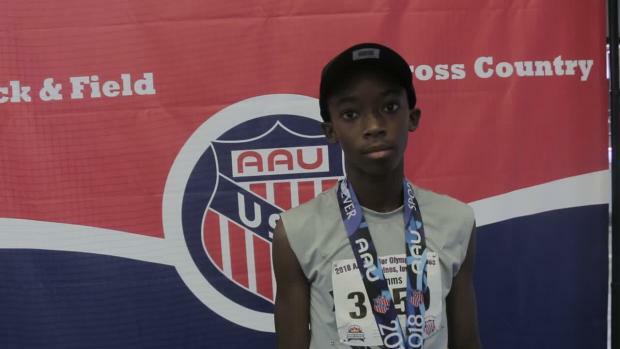 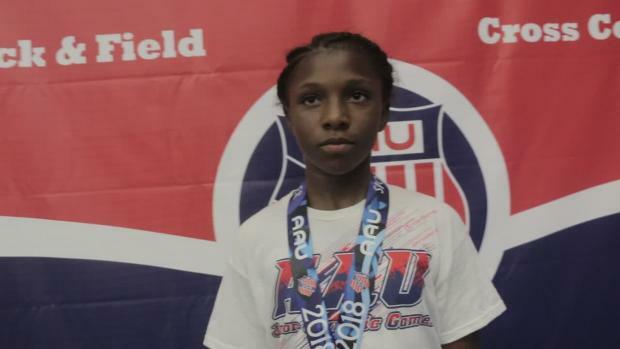 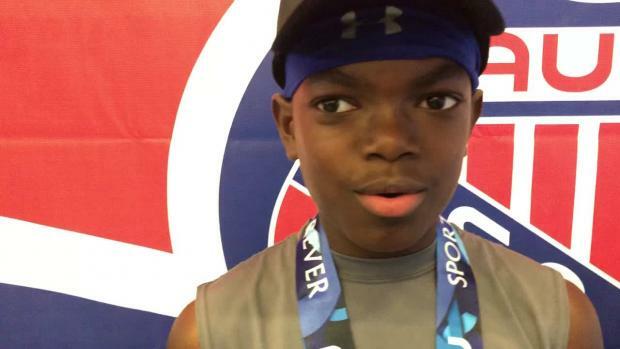 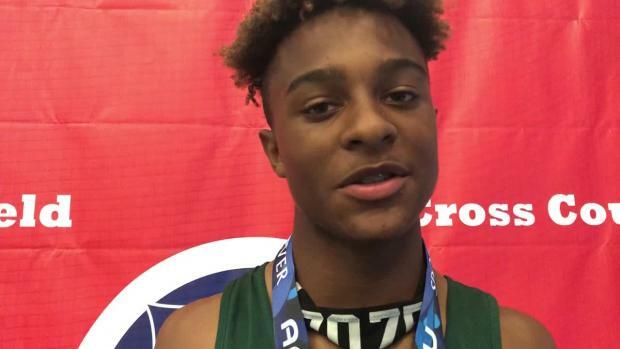 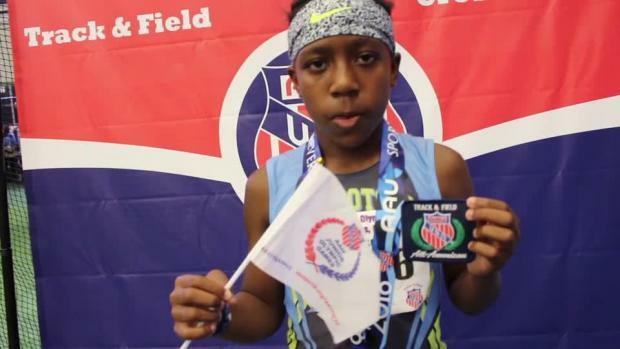 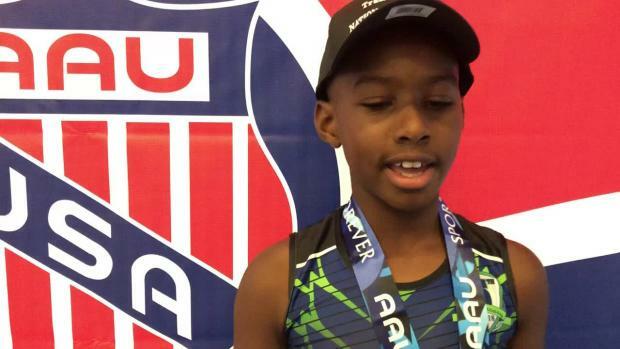 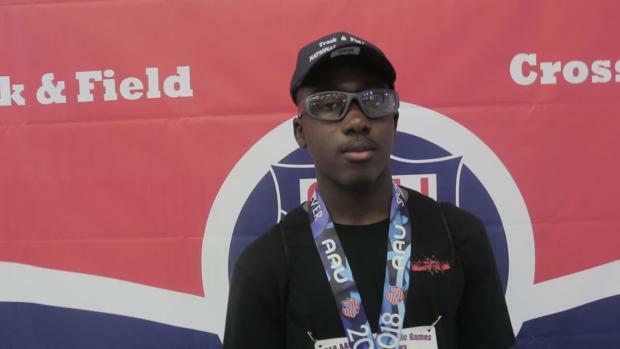 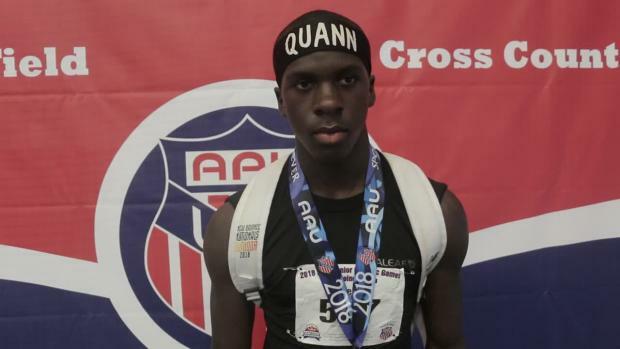 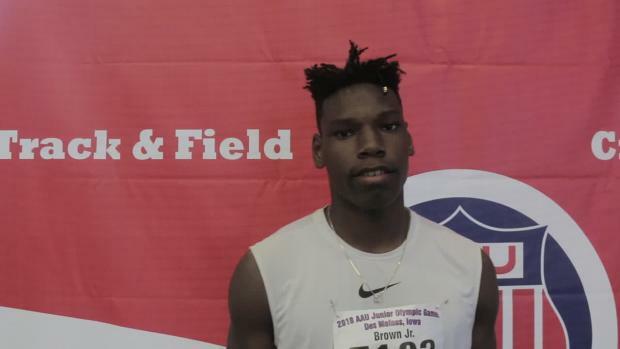 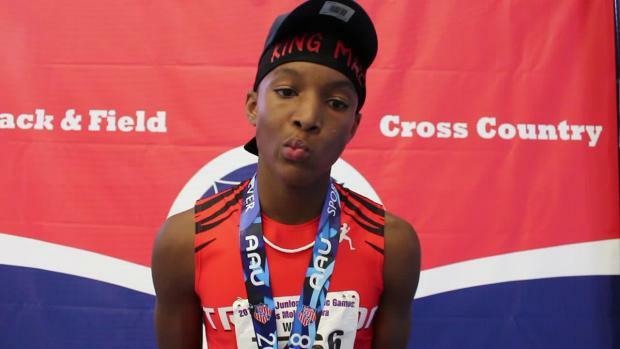 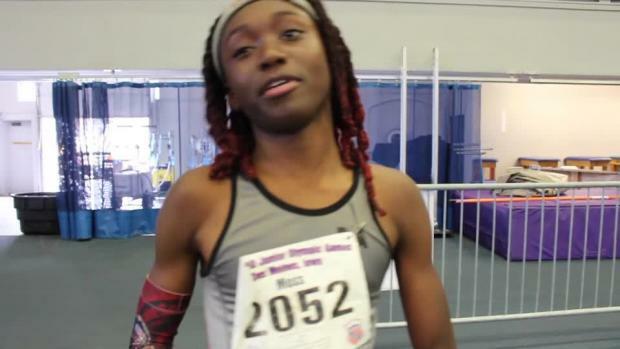 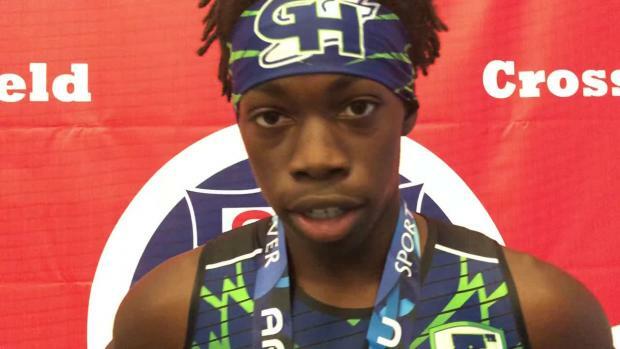 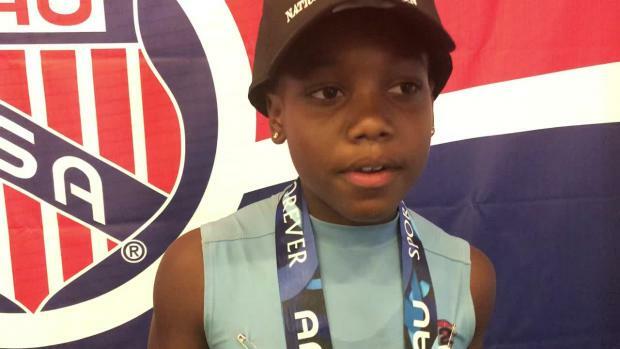 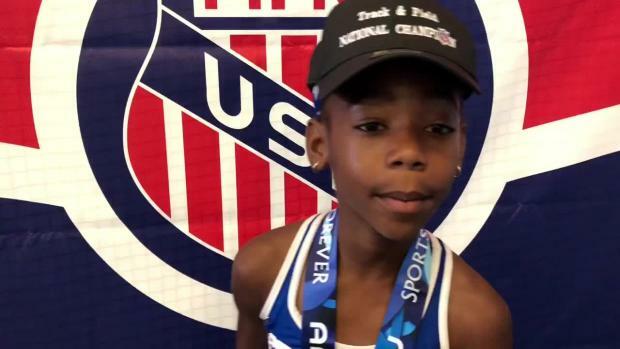 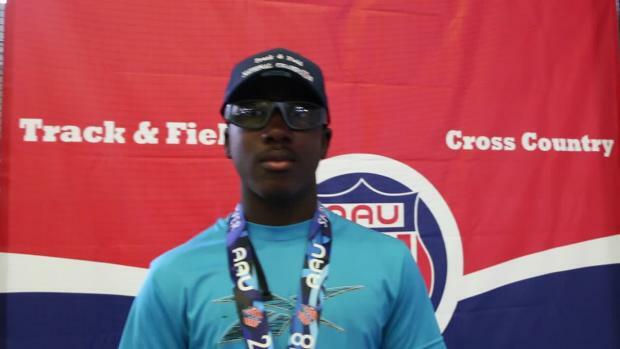 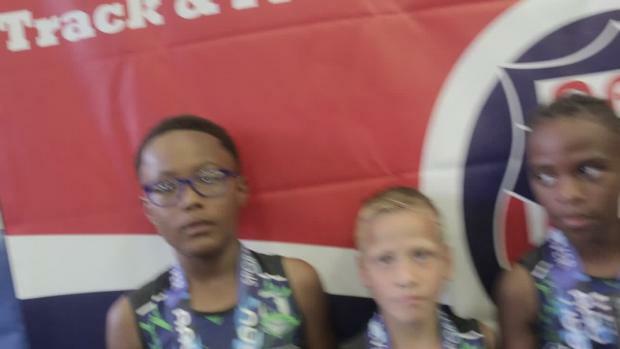 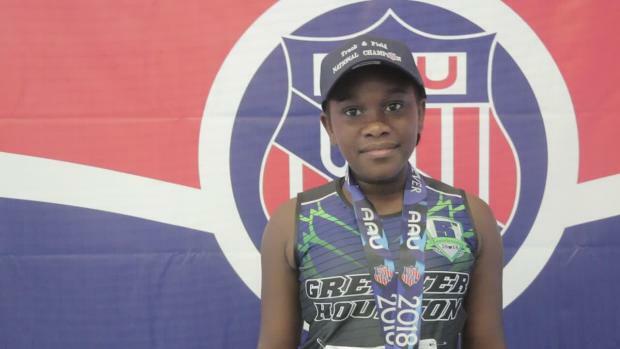 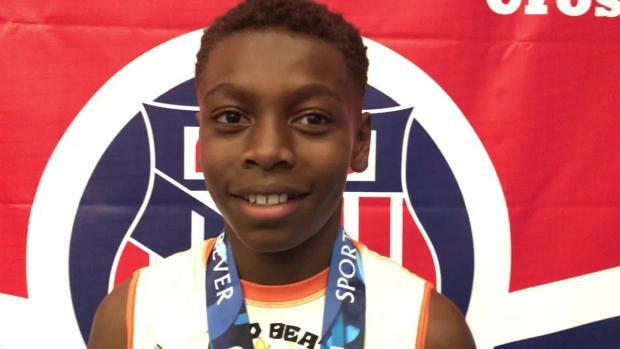 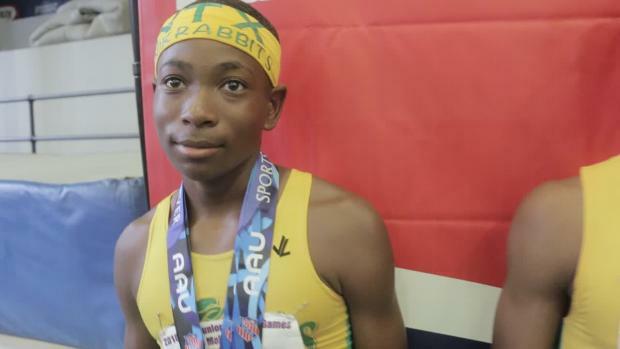 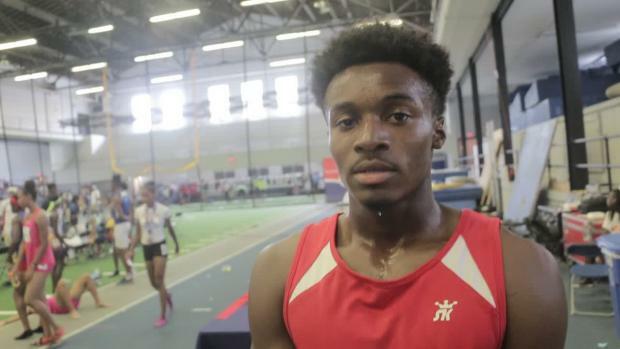 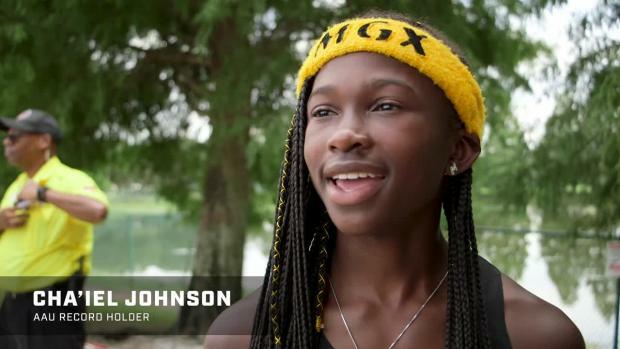 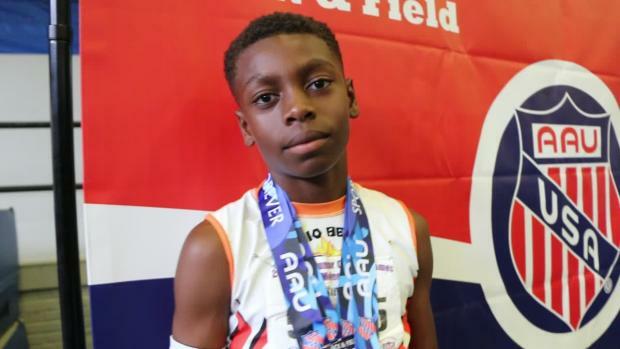 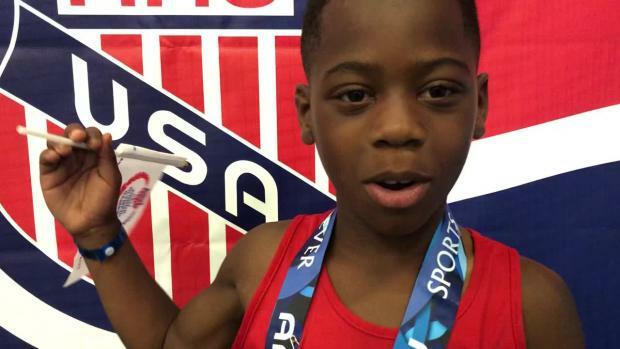 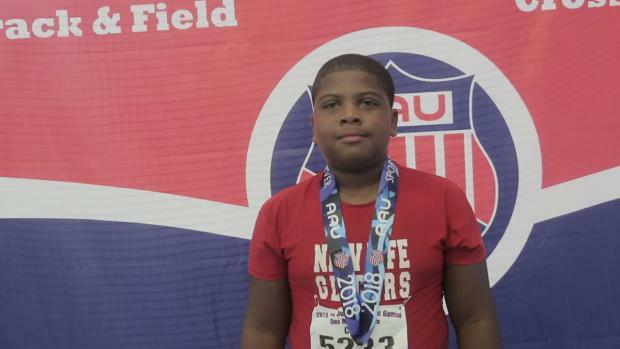 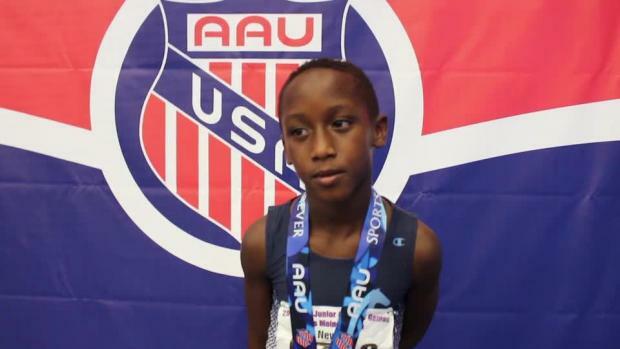 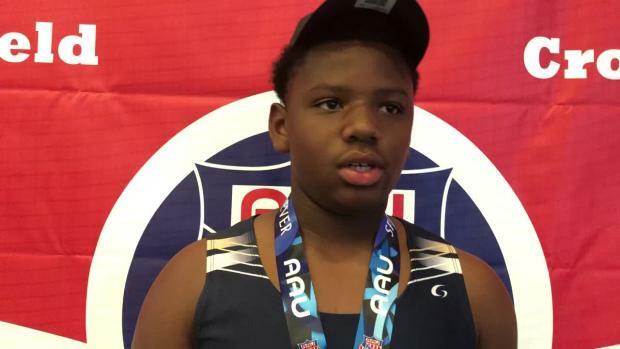 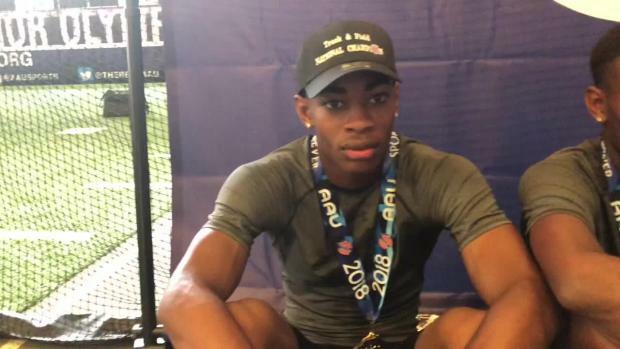 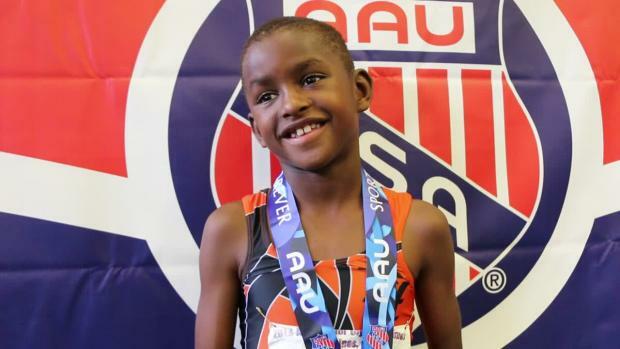 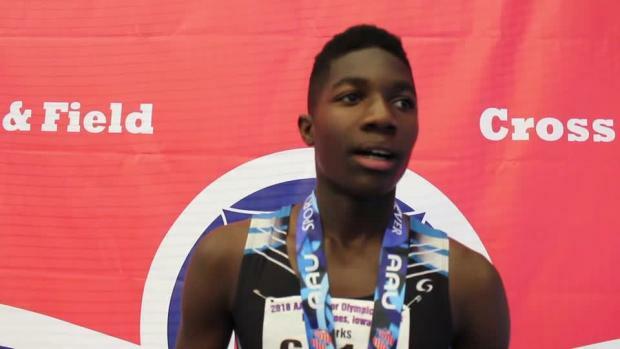 Cha'iel Johnson is getting ready to take on the AAU Junior Olympics. 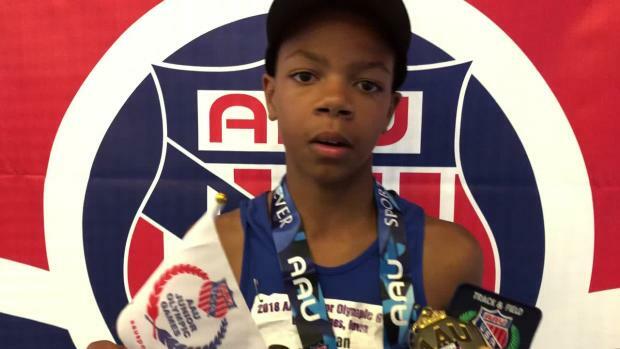 Check here daily for all your AAU Junior Olympic Games National records. 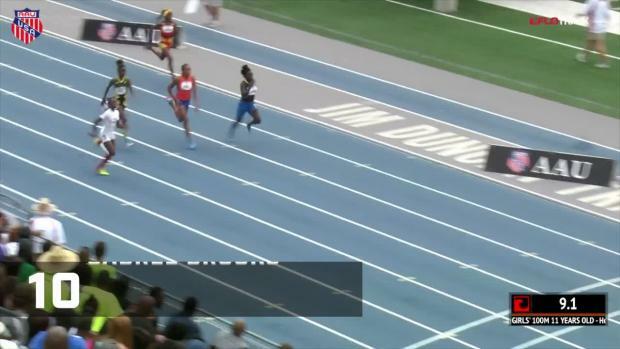 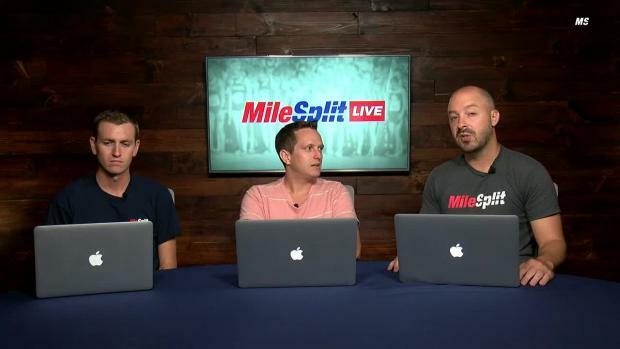 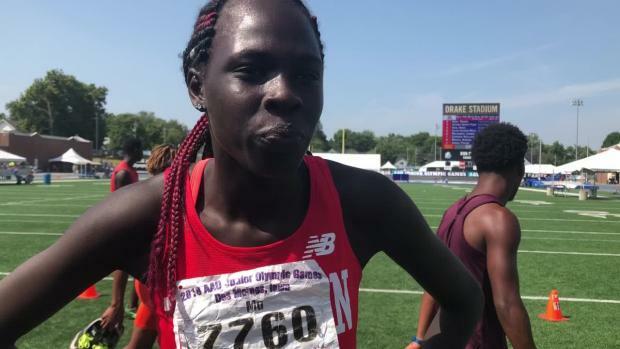 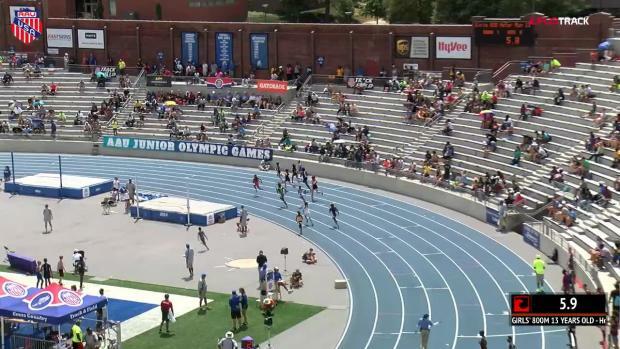 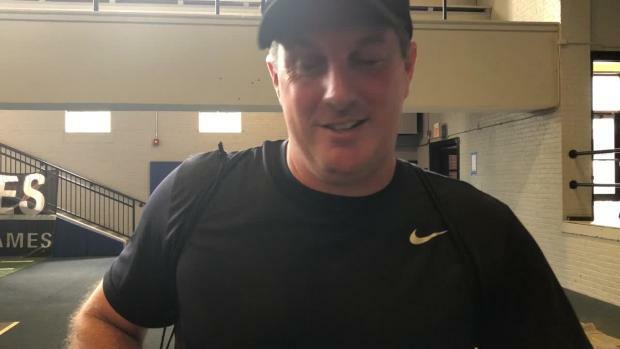 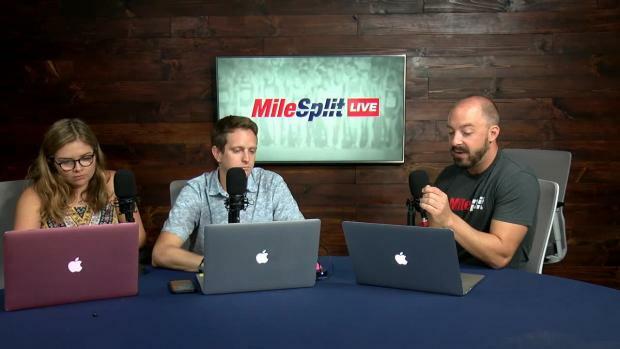 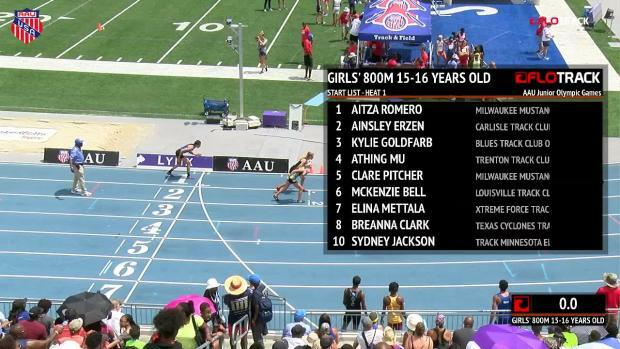 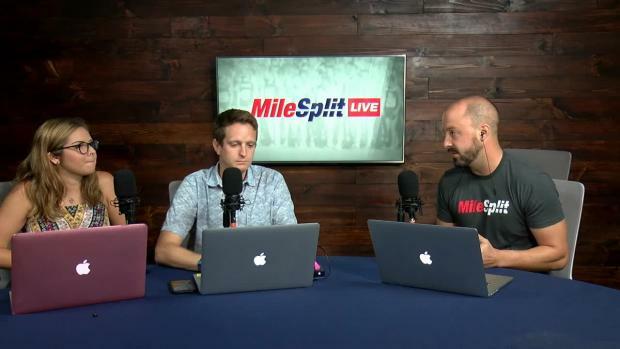 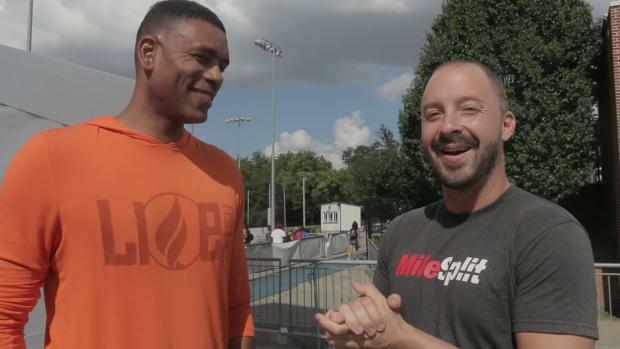 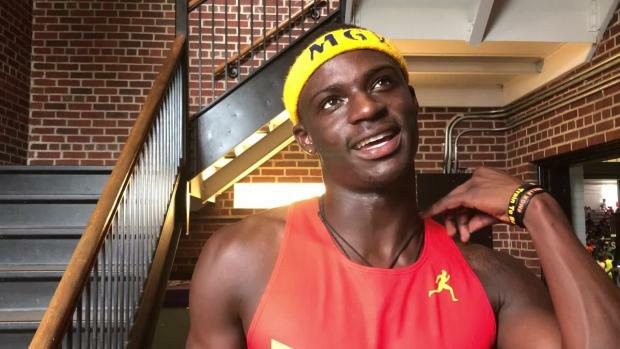 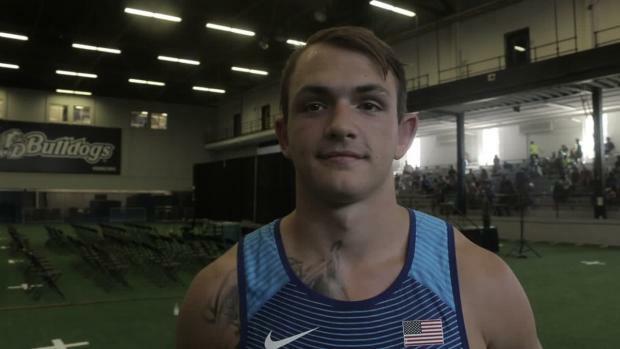 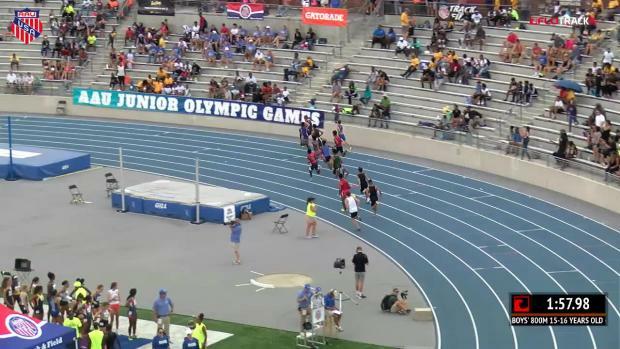 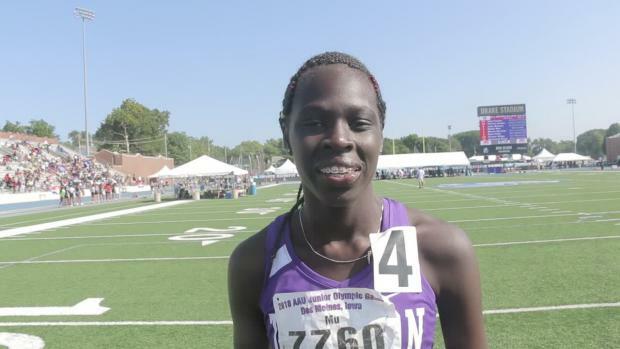 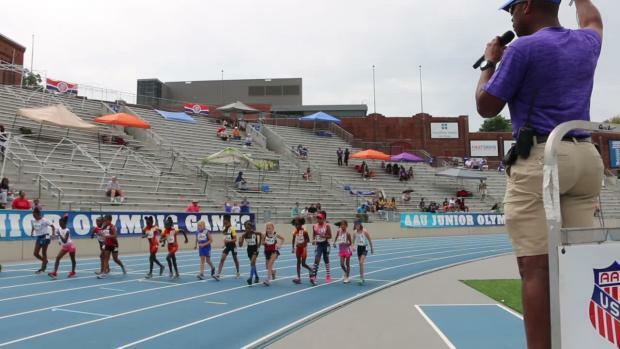 Wednesday's MileSplit LIVE covered all the best moments from the AAU Junior Olympic Games in Iowa. 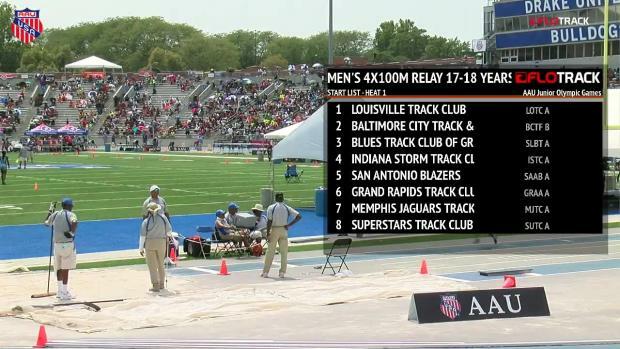 Did you miss any of the action? 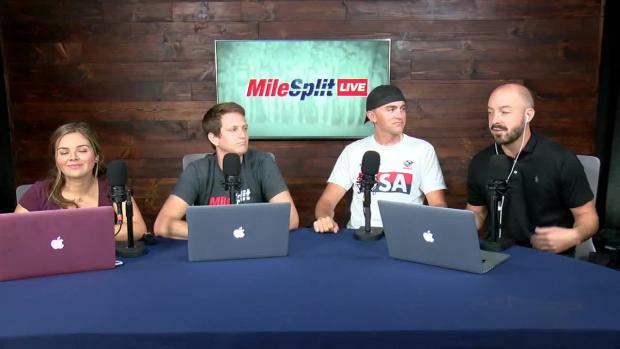 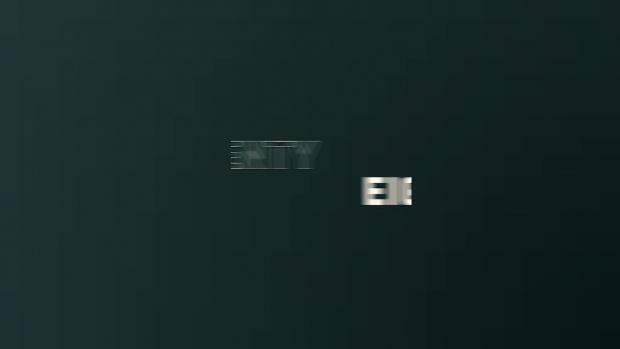 Hear what the crew had to say about their experience. 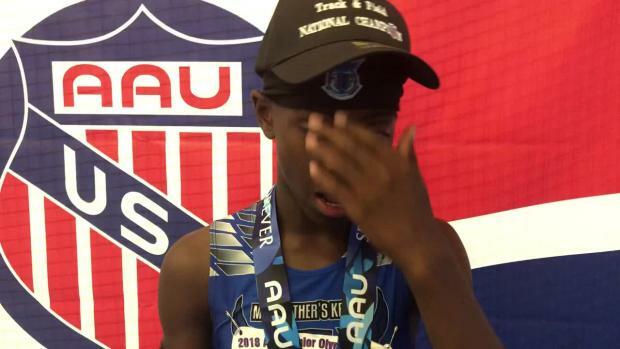 Topics include: Lasting impression of Tyrese Cooper's careerAthing Mu's phenomenal display eventsPerformances that went under the radarThe best young talent at the AAU Junior Olympic GamesThe talent most likely to breakthrough in 2019 not named Brandon Miller or Athing MuOur redeeming memories from this year's GamesDon't miss it! 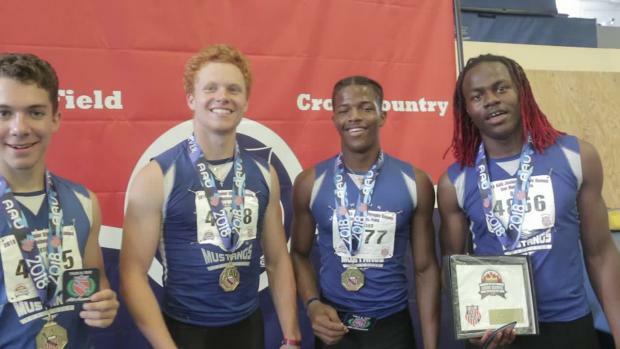 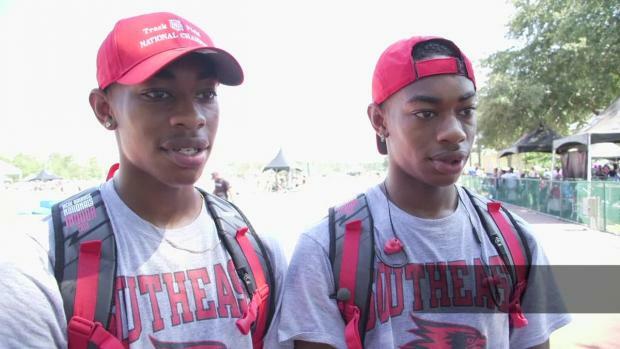 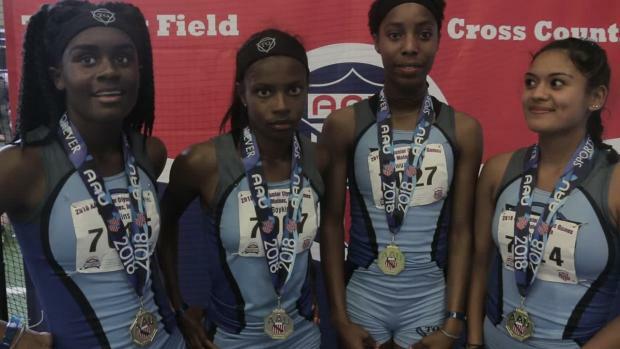 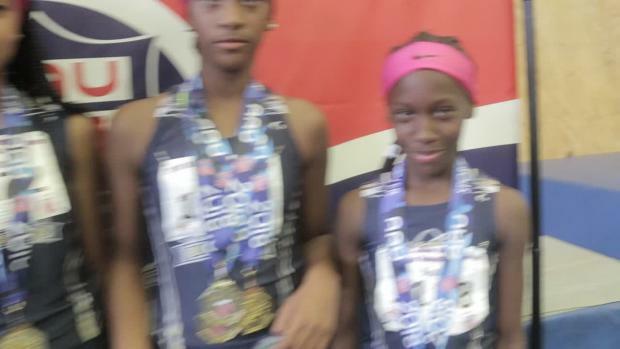 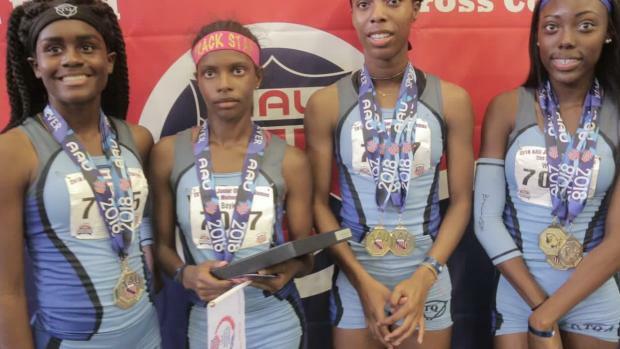 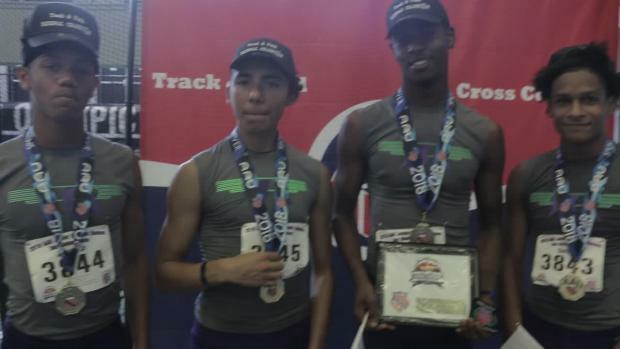 The Wings Track Club out of Houston, Texas, is ready to bring the speed to the AAU Junior Olympic Games 4x400m relays. 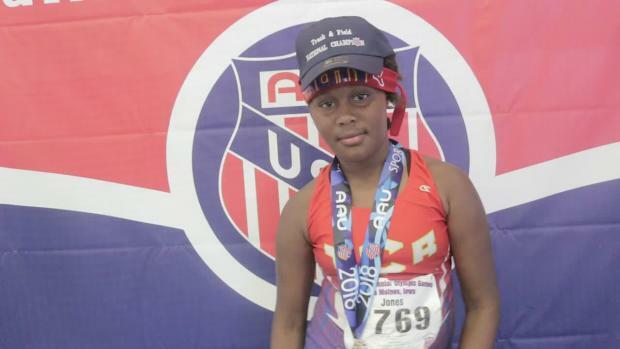 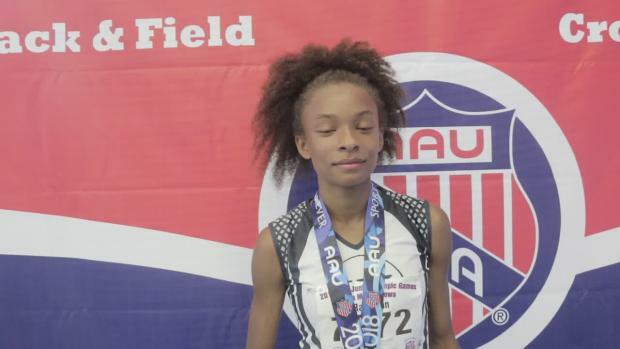 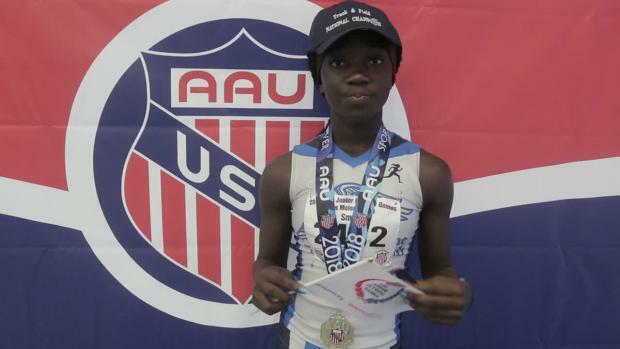 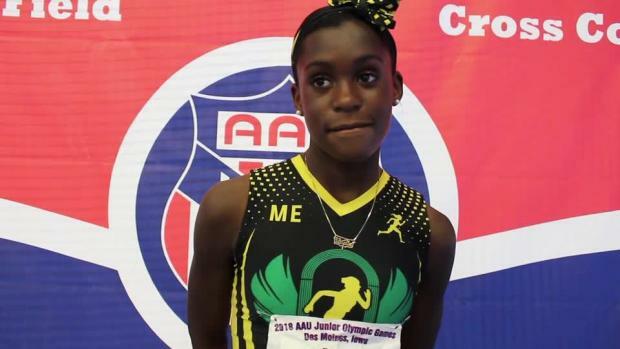 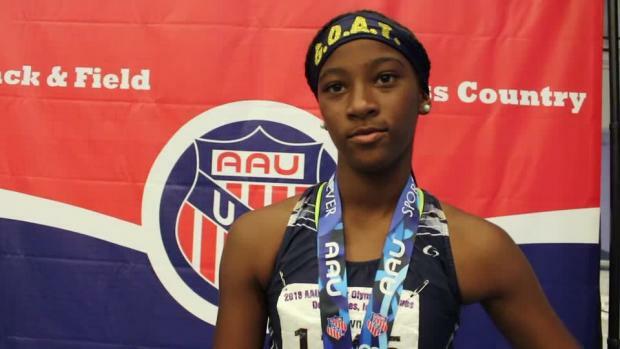 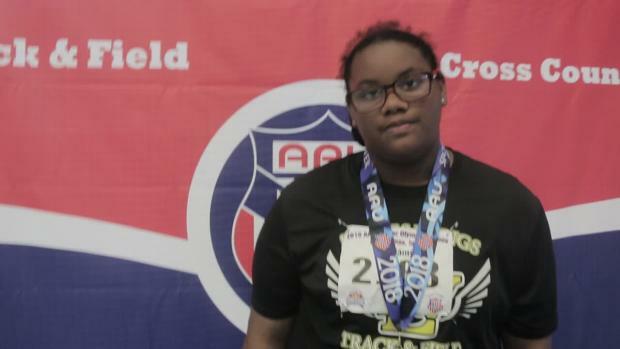 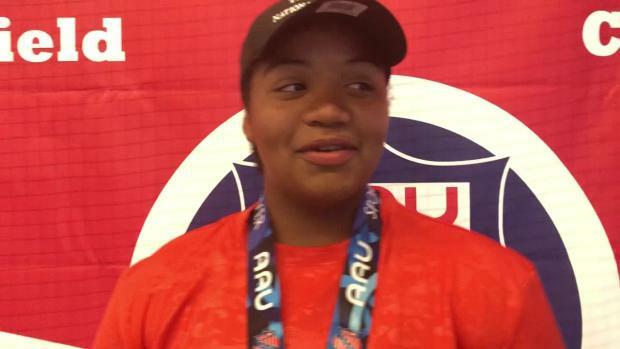 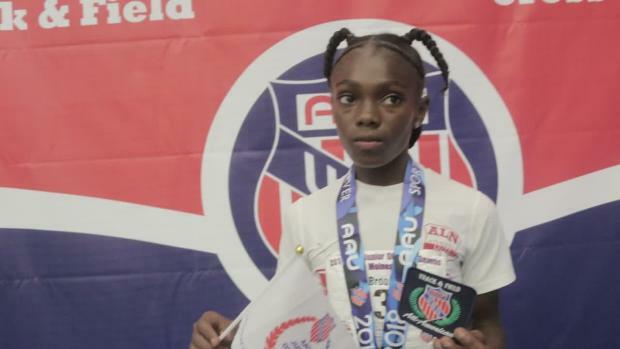 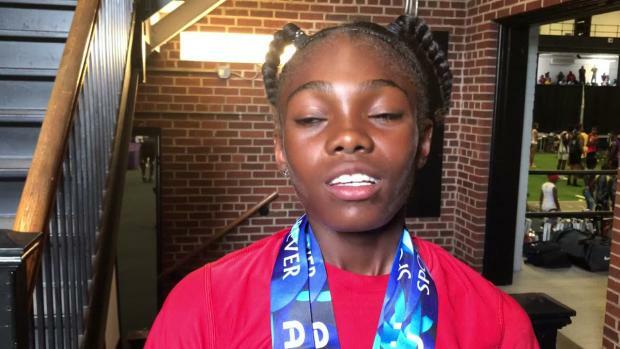 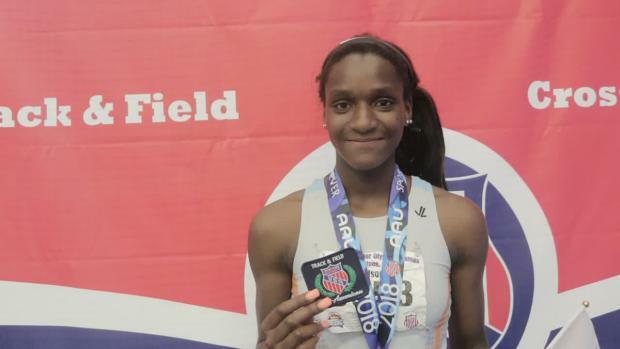 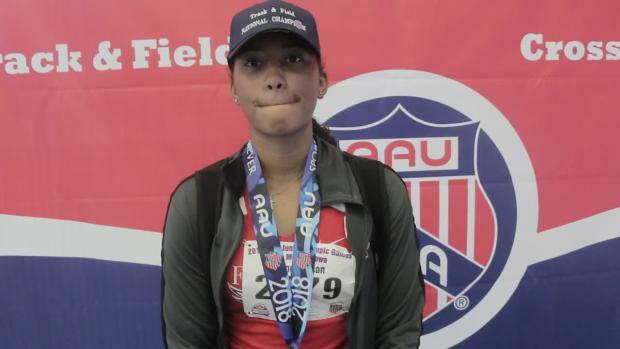 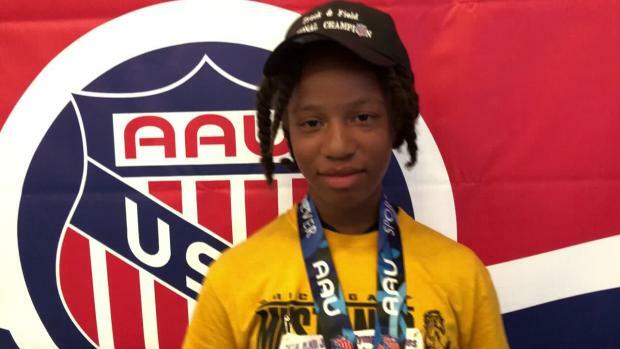 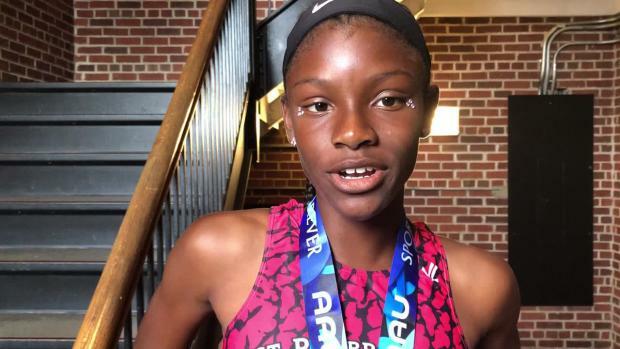 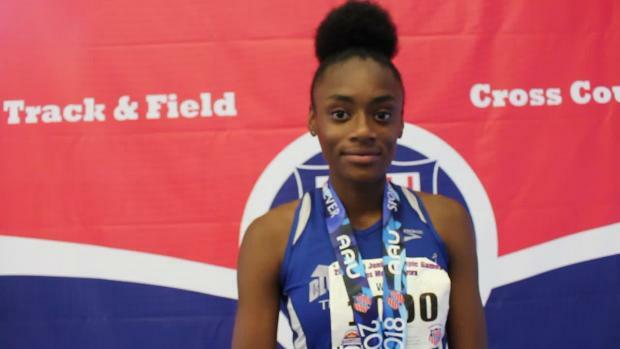 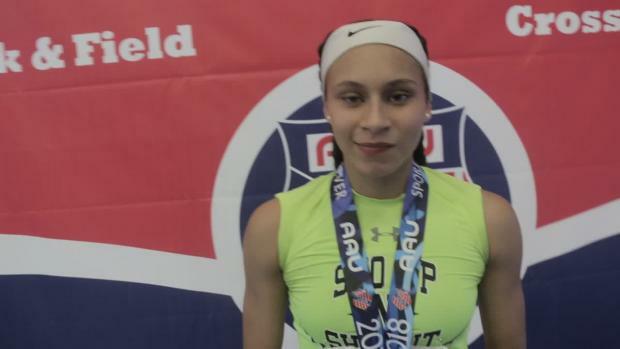 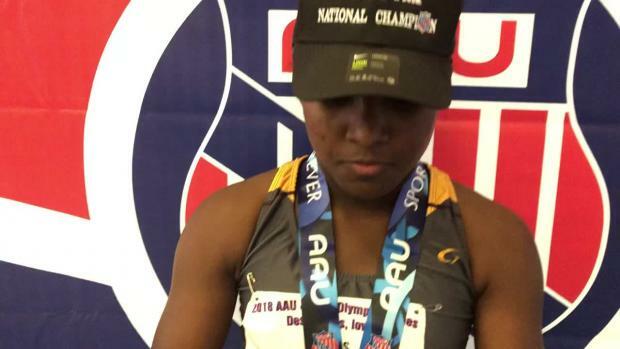 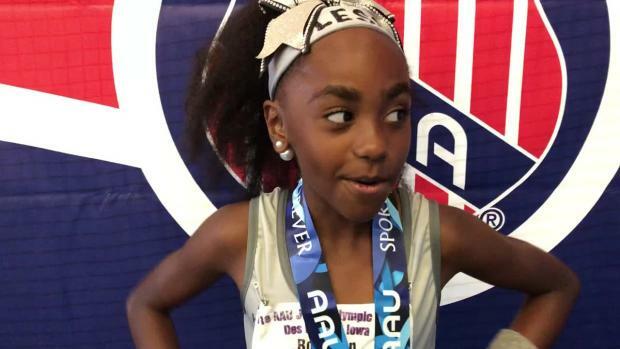 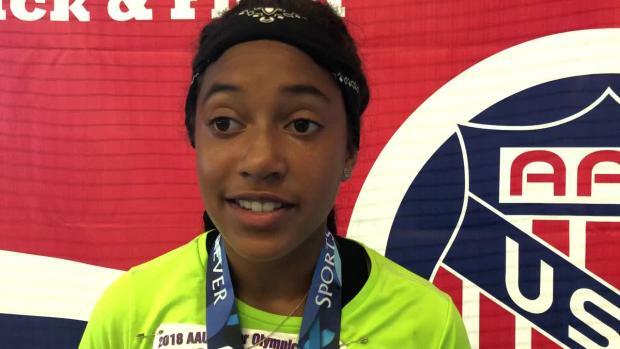 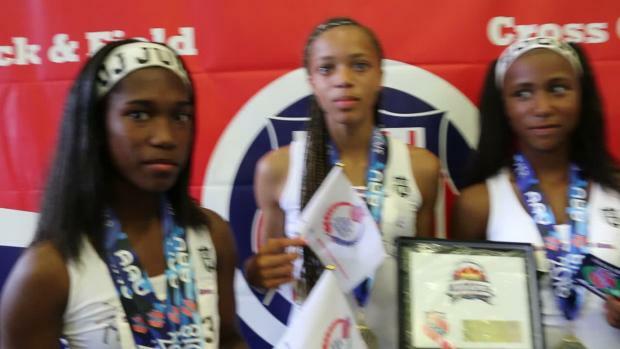 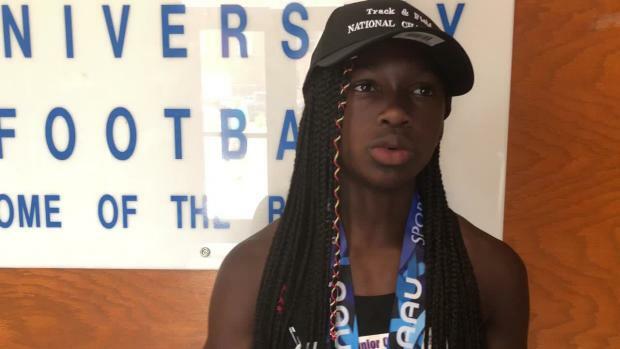 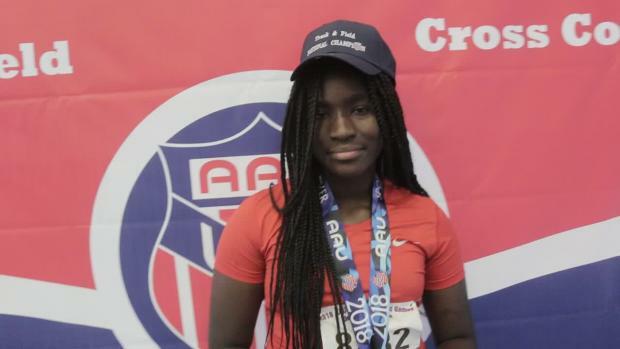 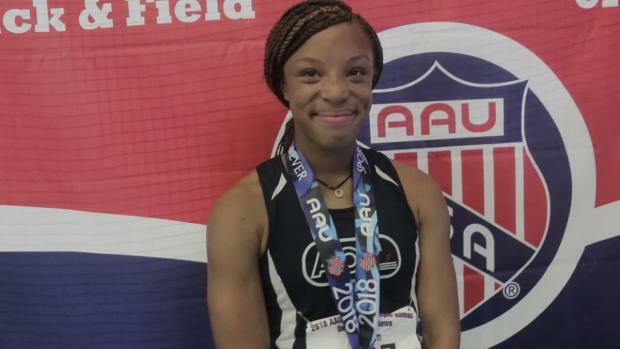 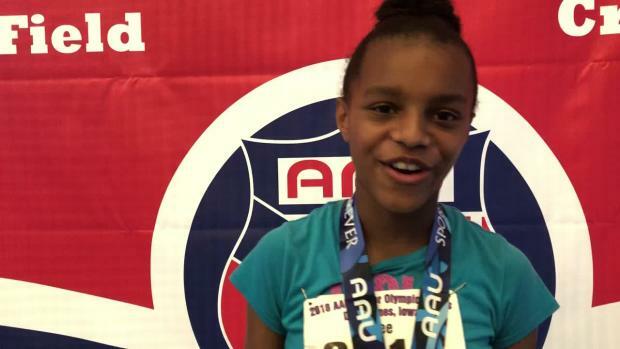 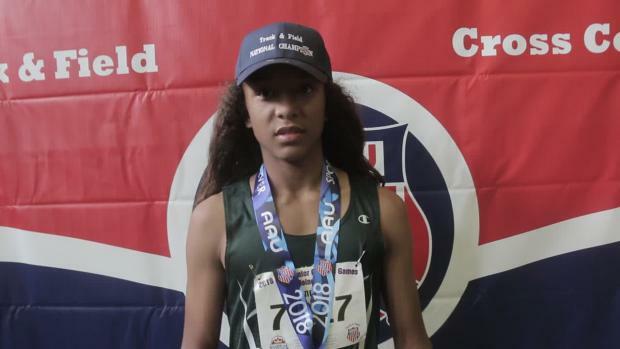 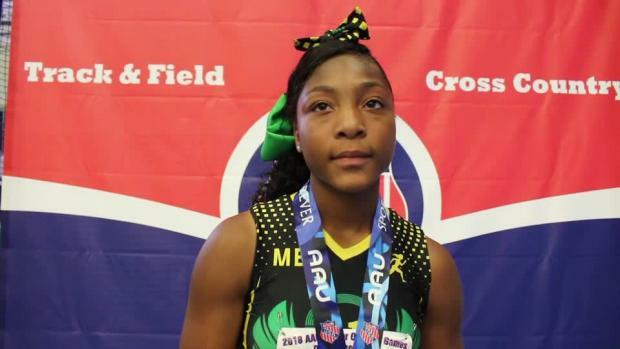 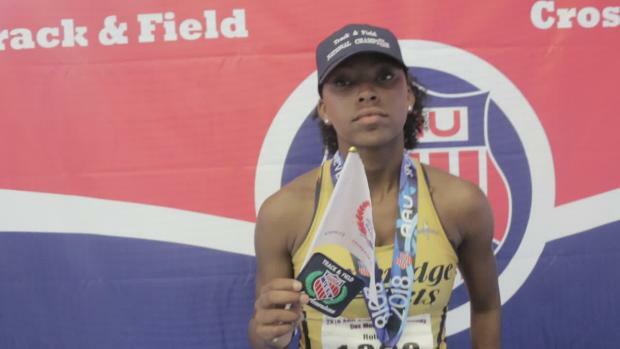 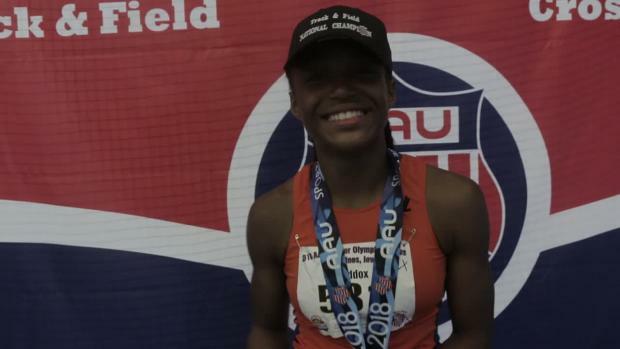 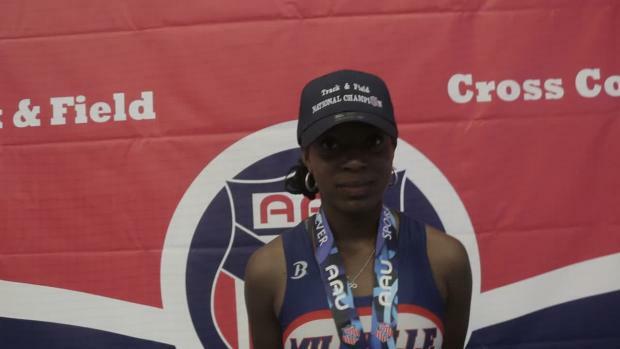 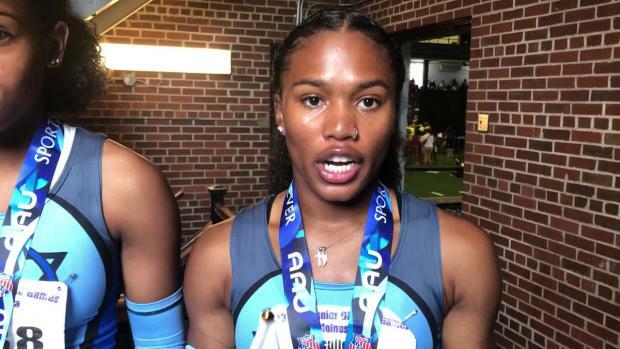 Motor City's Aasia Laurencin claimed the 100m hurdles victory at the AAU Junior Olympic Games in the 15-16 age division due to her time of 13.75. 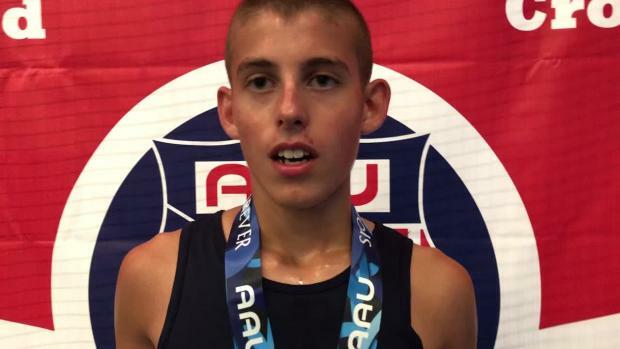 The Ohio Heat's Evan Matthews recorded a US No. 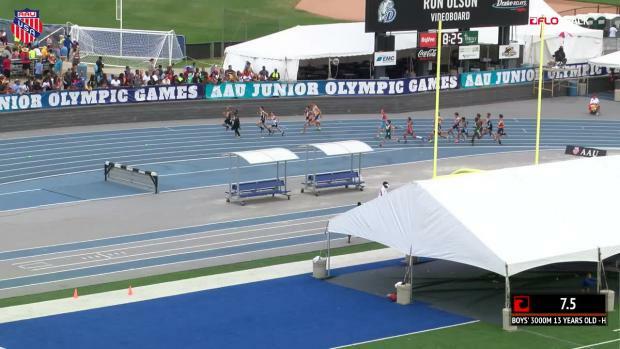 16 time of 52.76 to win the 400m hurdles race in the 17-18 division at the AAU Junior Olympic Games. 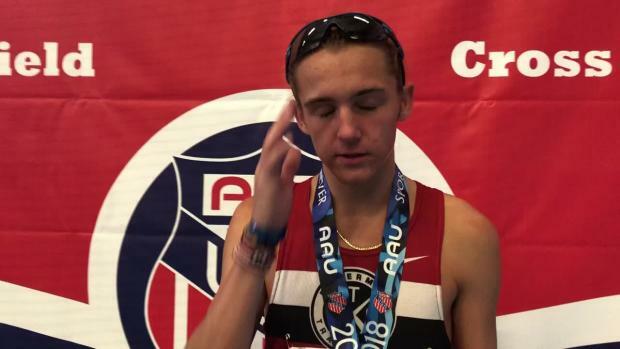 We asked race walk athletes on Day 1 of competition why they like the race walk, we got some fun and interesting answers. 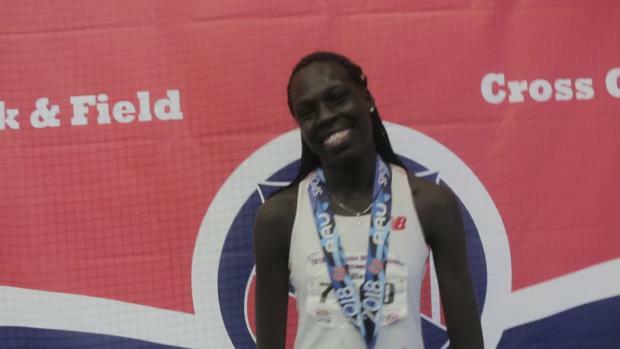 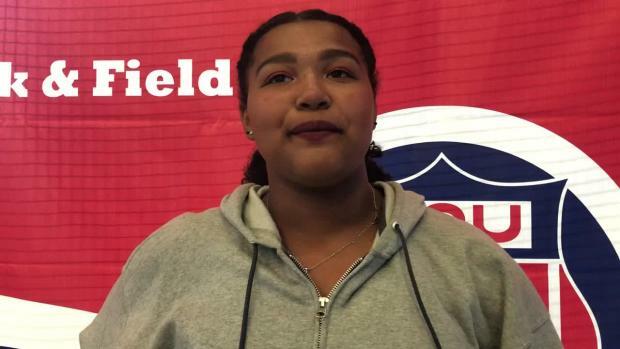 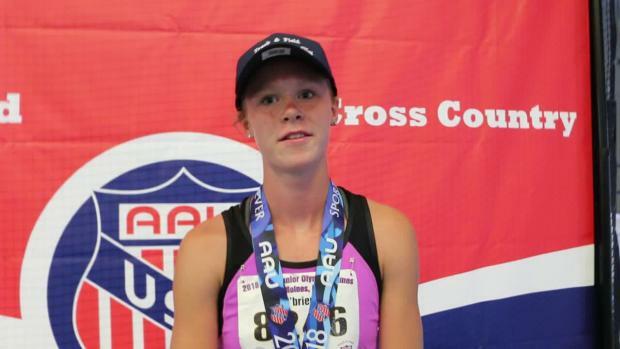 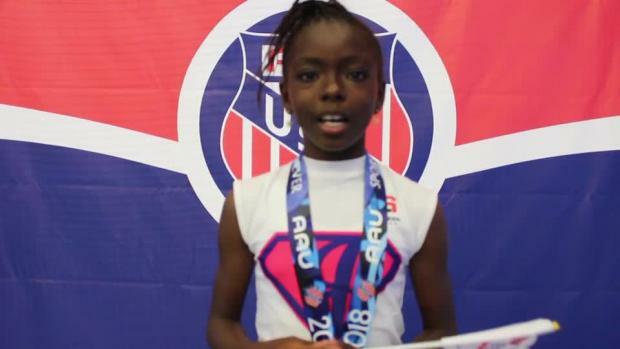 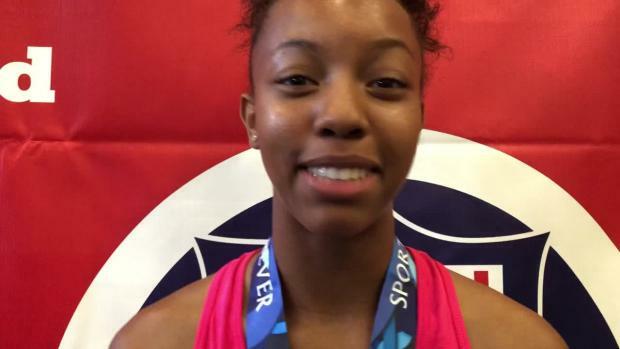 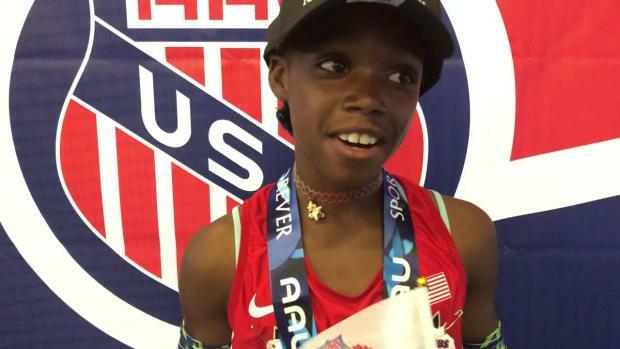 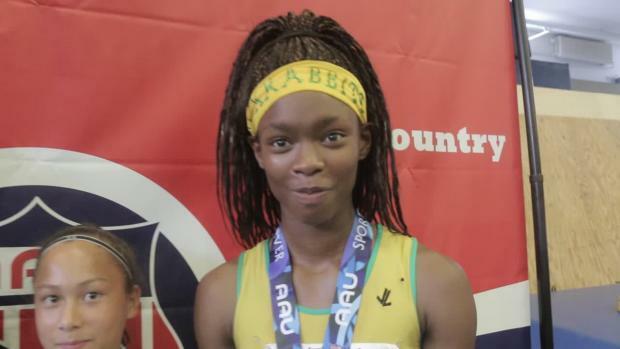 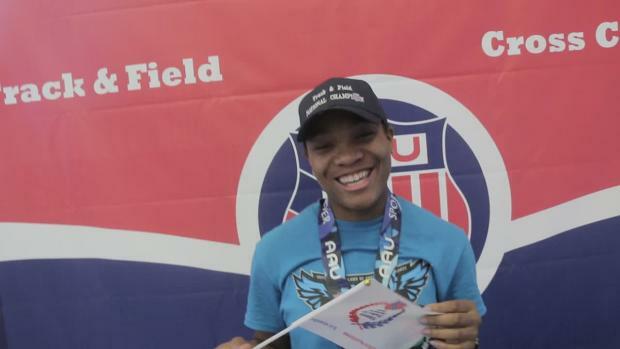 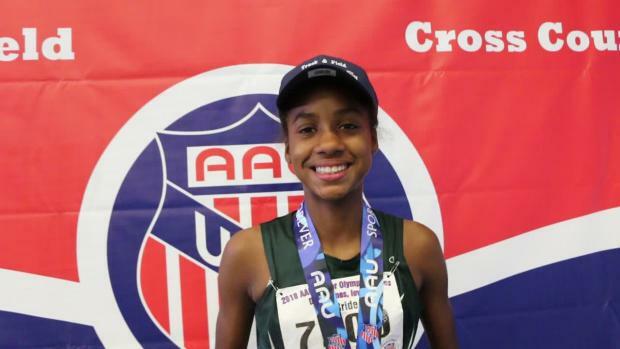 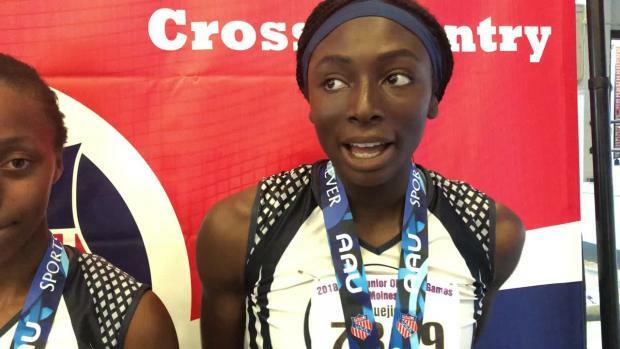 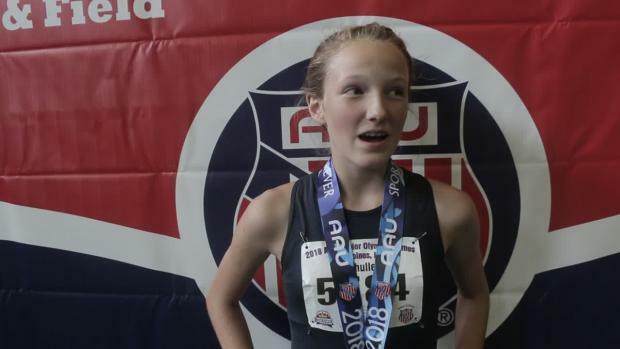 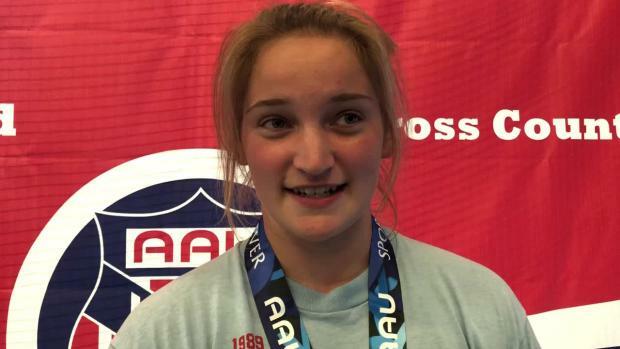 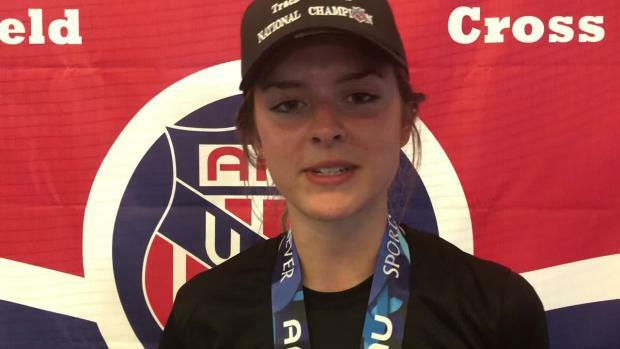 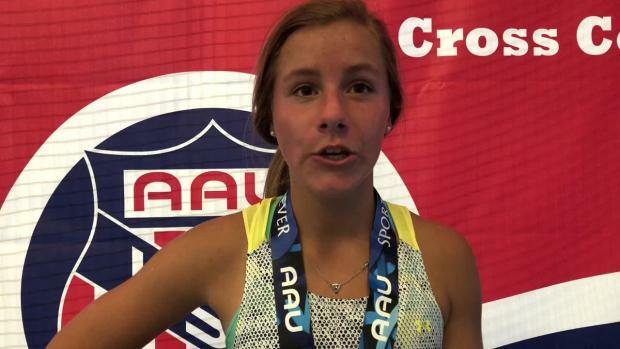 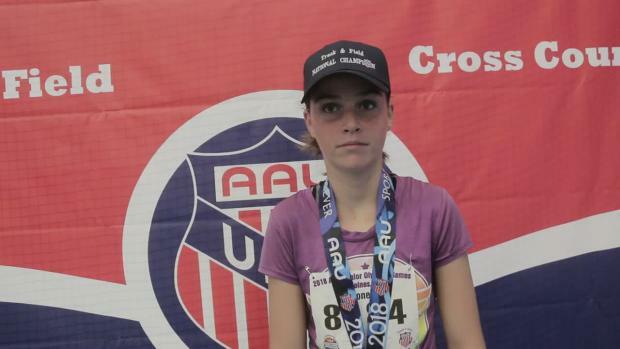 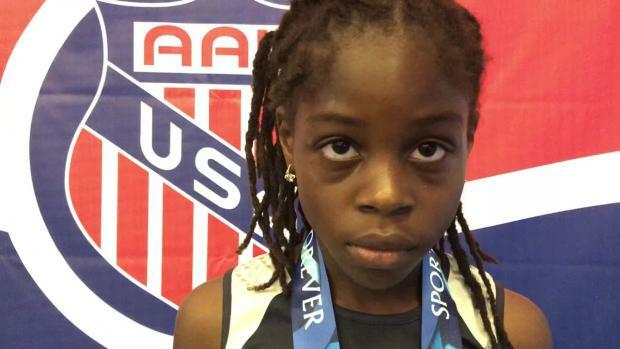 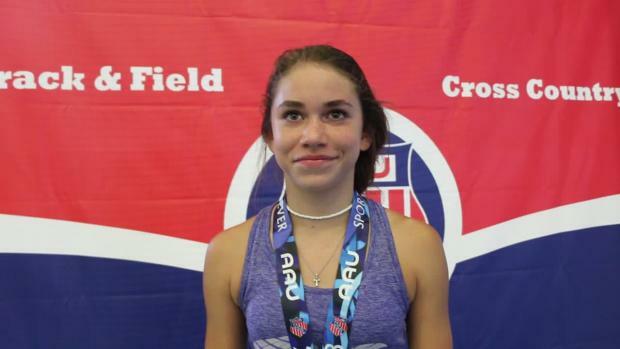 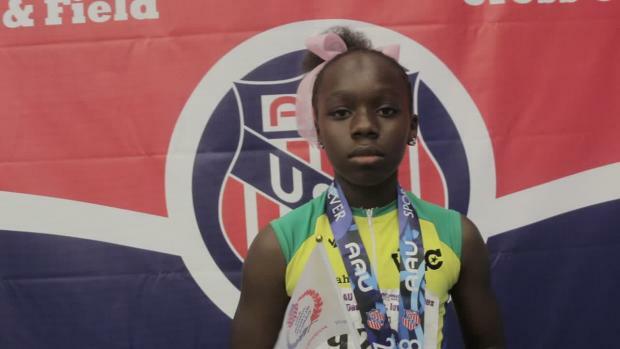 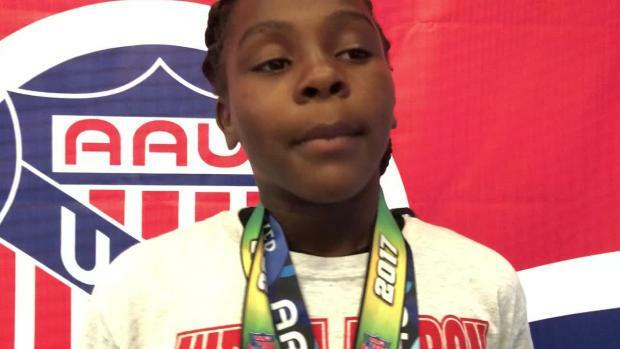 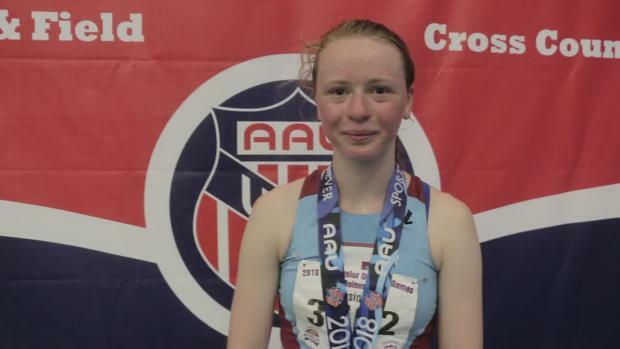 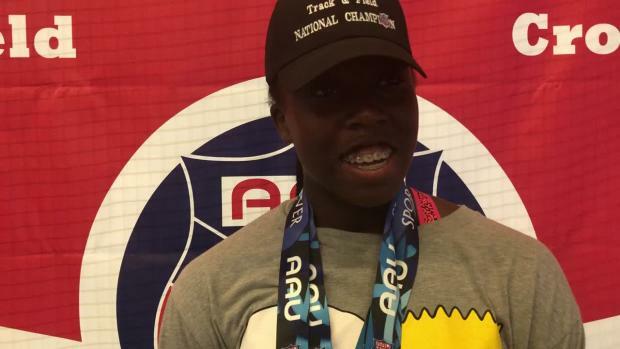 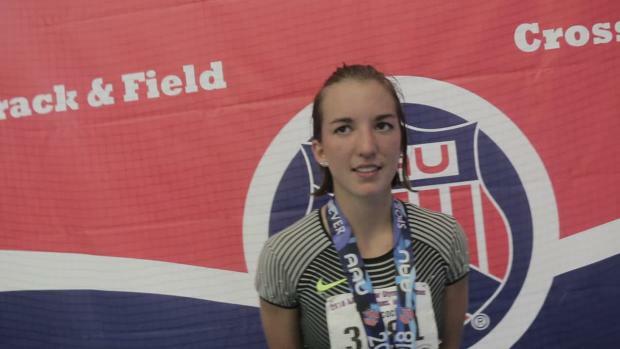 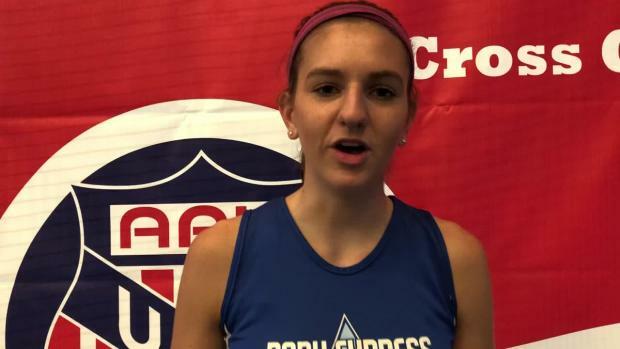 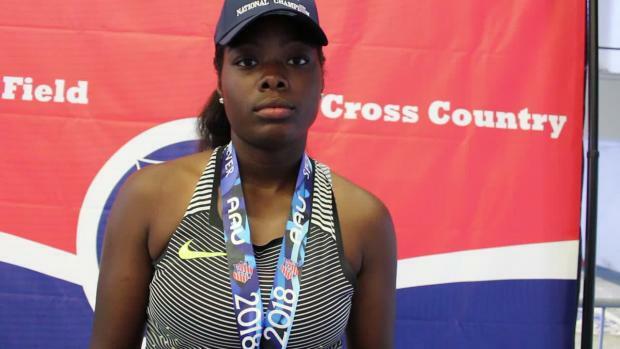 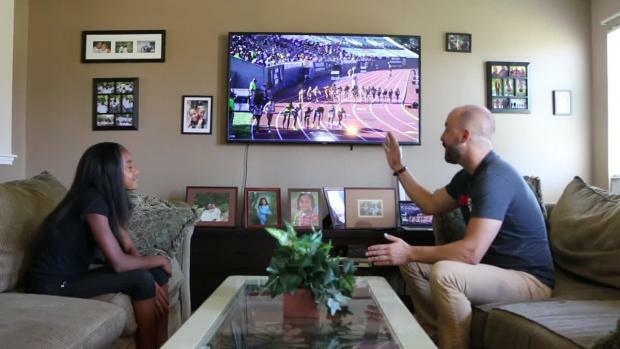 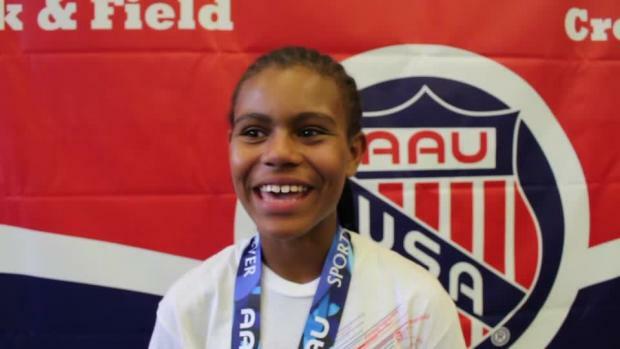 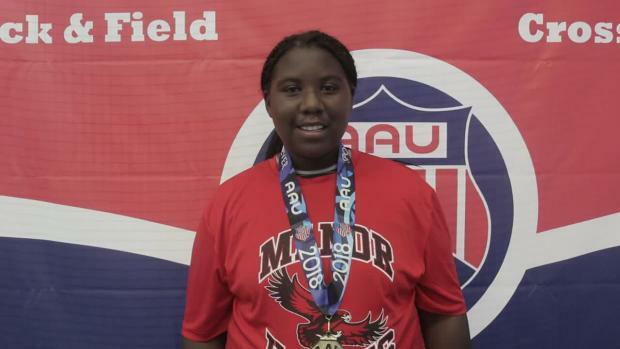 MileSplit sat down with AAU Junior Olympic star Krianne McBride to play a game of trivia. 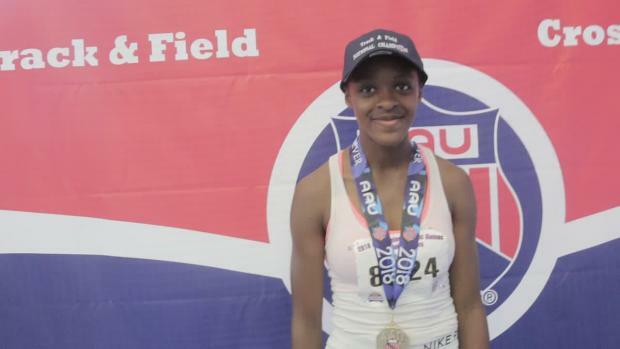 Check out the video to see how she did. 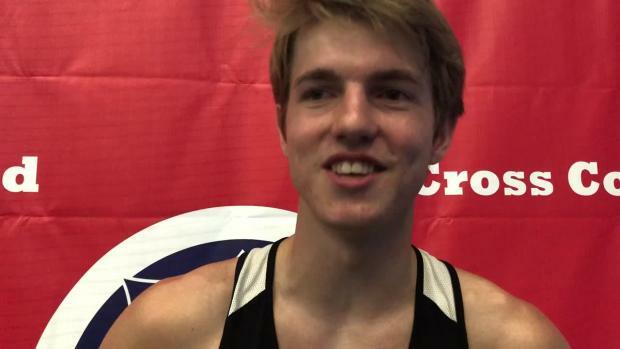 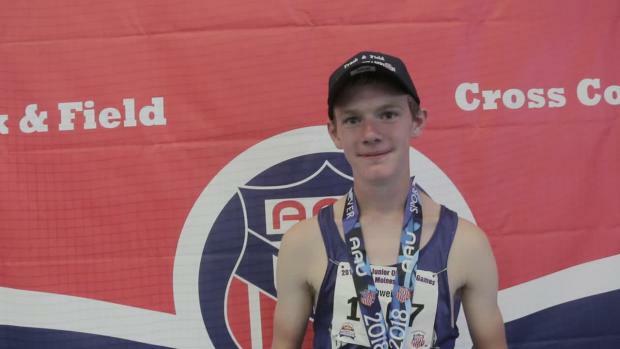 It may be the start of August, but Bel Air's Kieran McDermott is still racing and racing well. 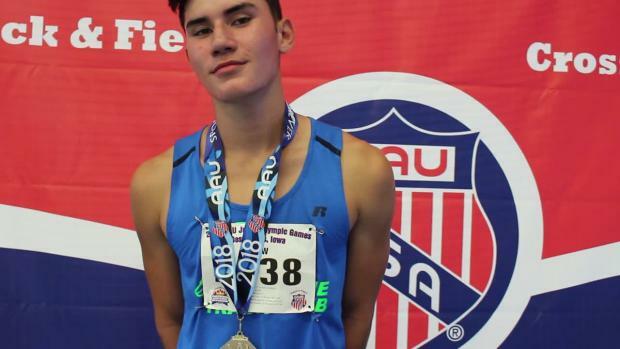 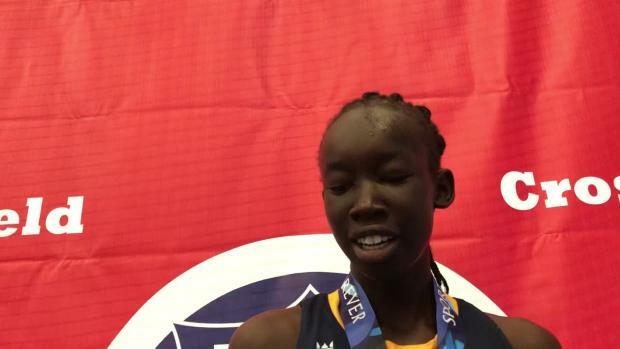 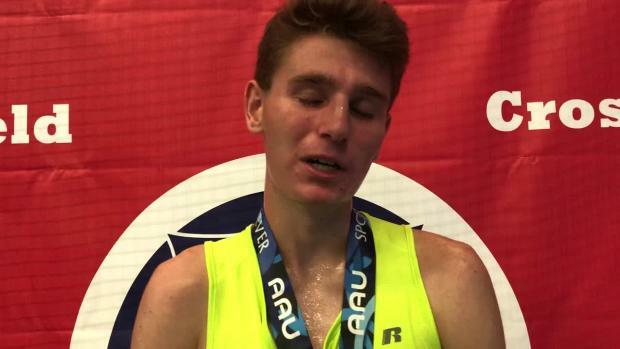 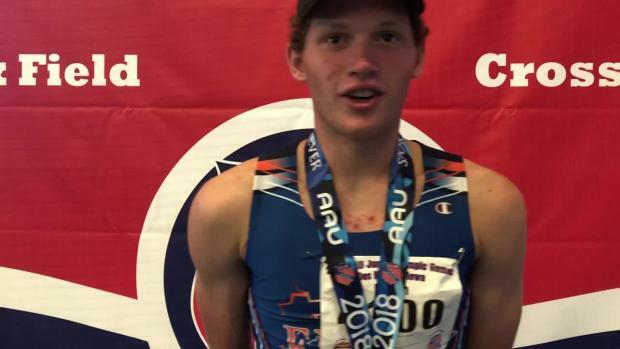 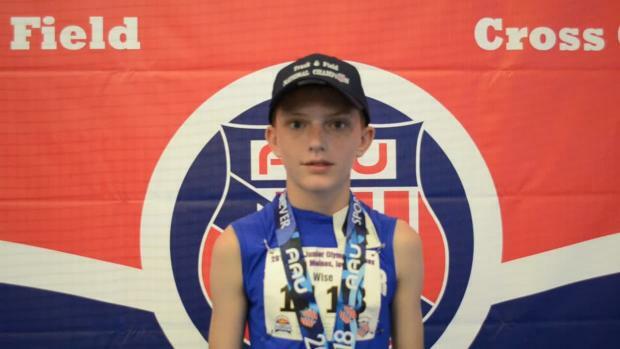 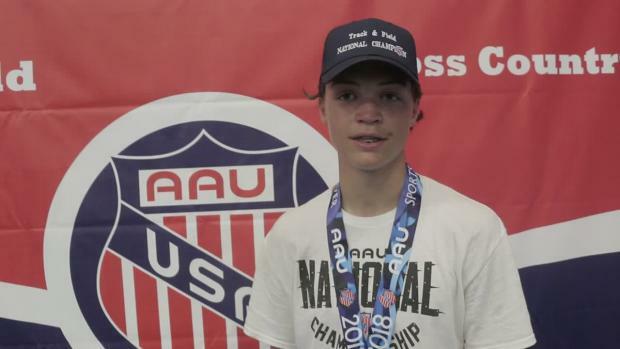 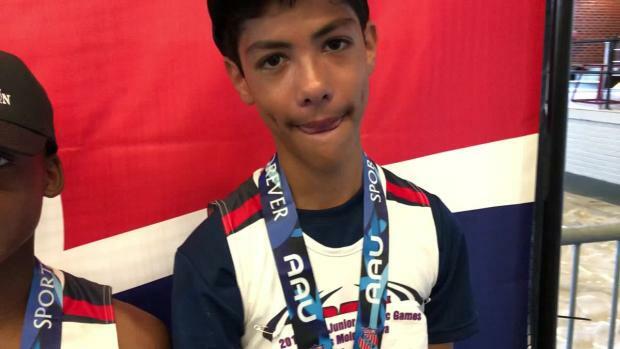 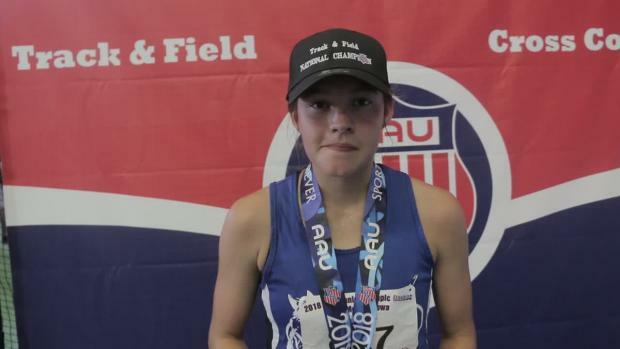 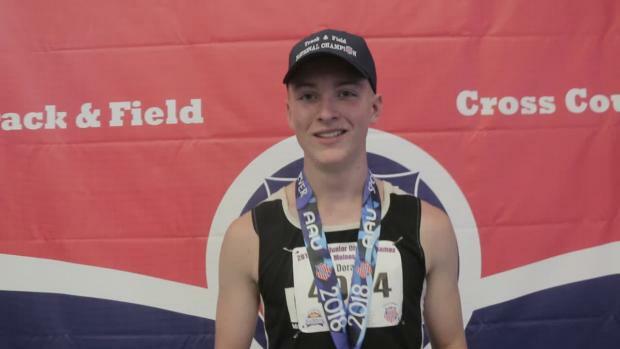 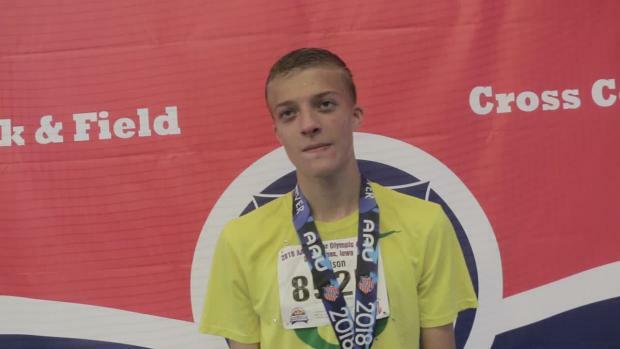 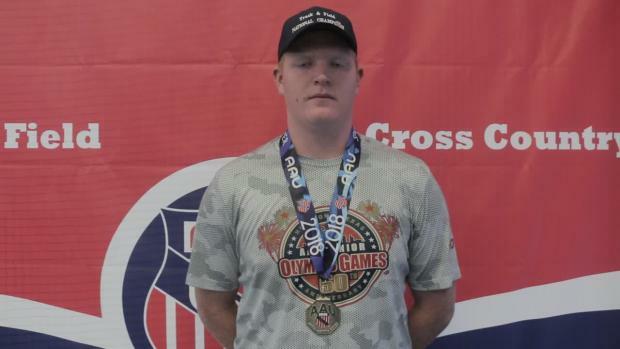 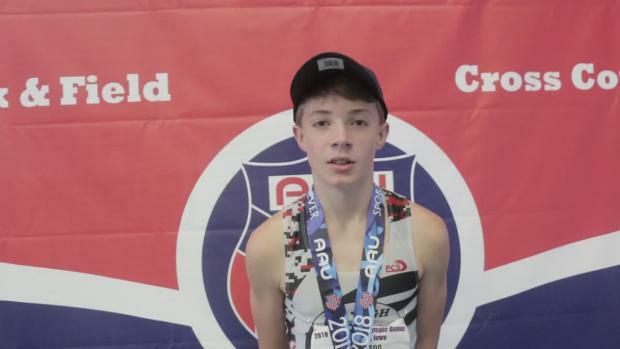 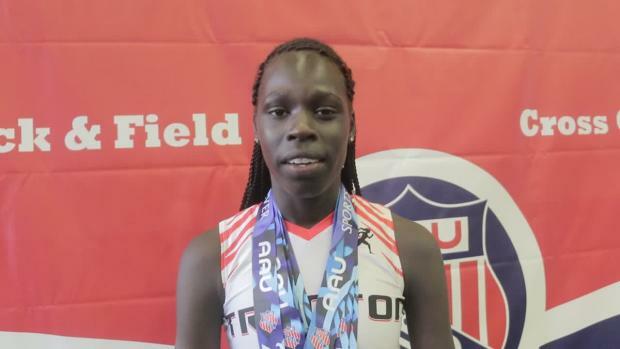 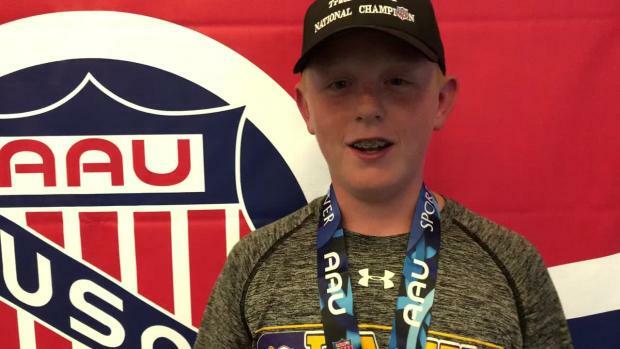 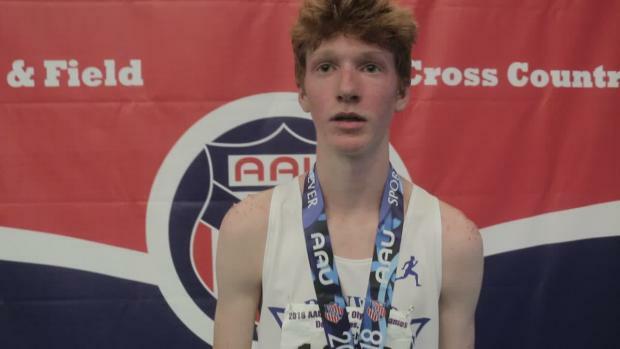 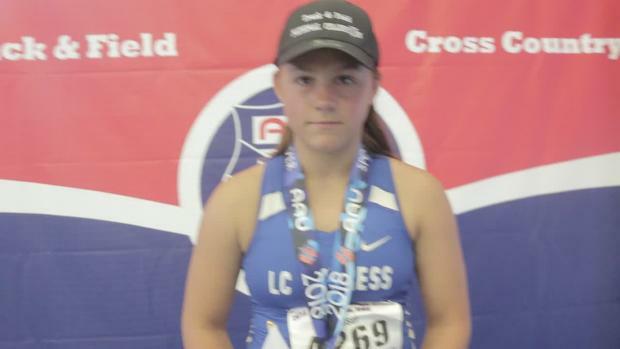 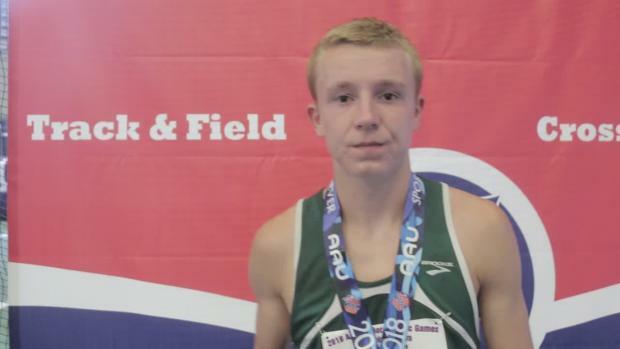 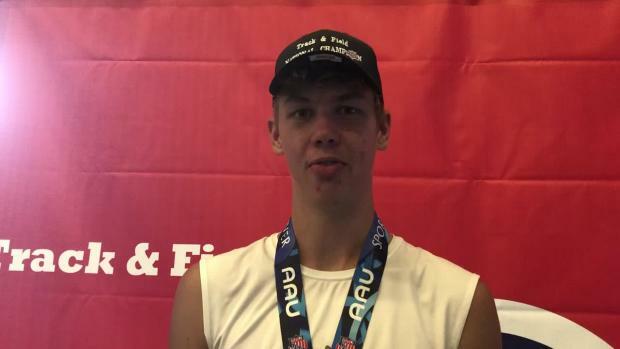 McDermott won the AAU Junior Olympic games national title in the 17-18 year old age group for the 1500 meter run on Tuesday in Des Moines, Iowa with a time of 3:58.30. 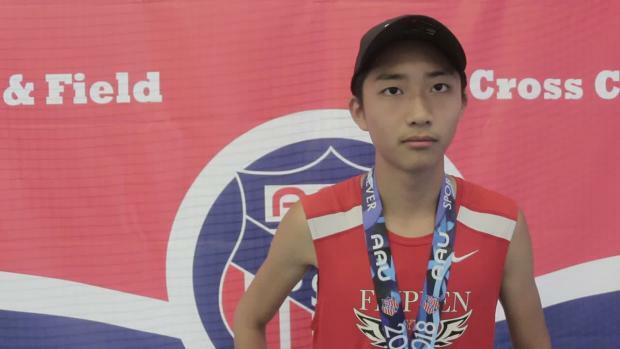 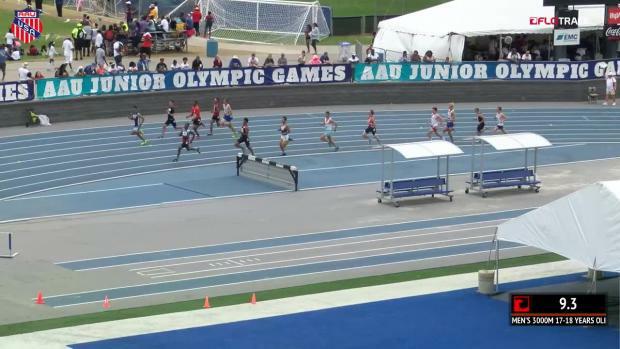 The final 200m of the 17-18-year-old boys 1500m was a battle at the 2017 AAU Junior Olympics. 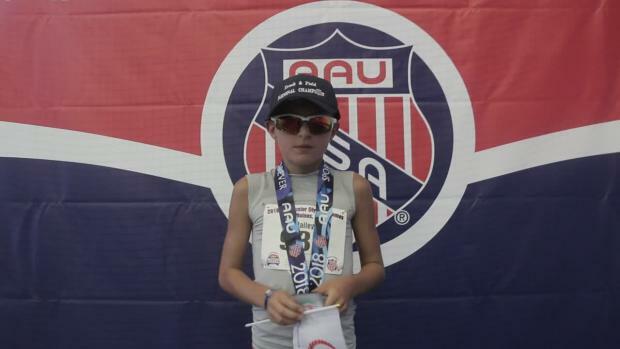 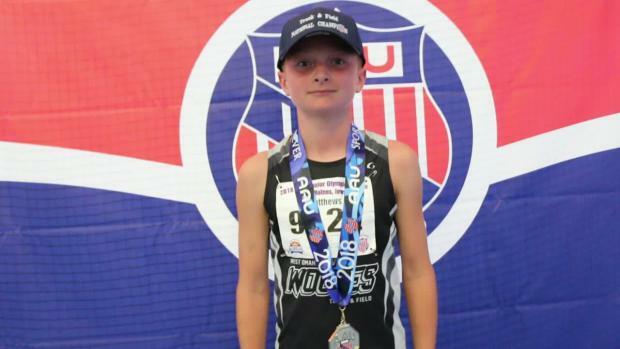 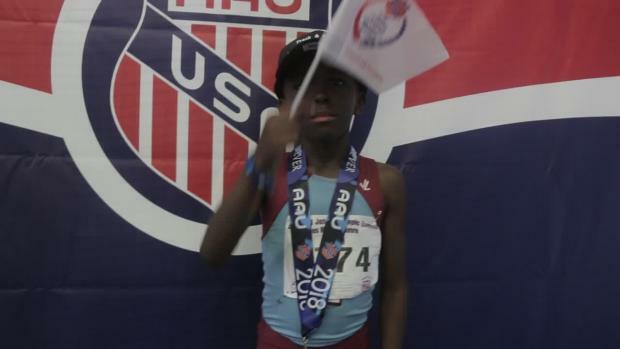 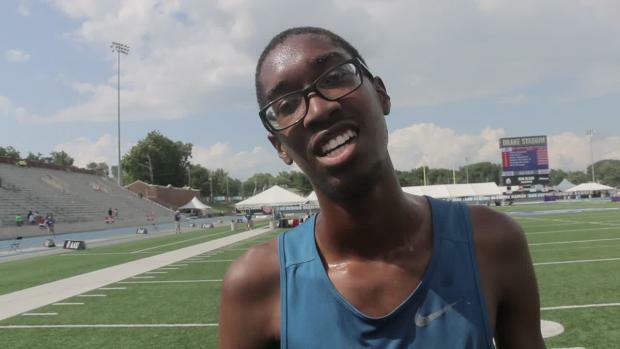 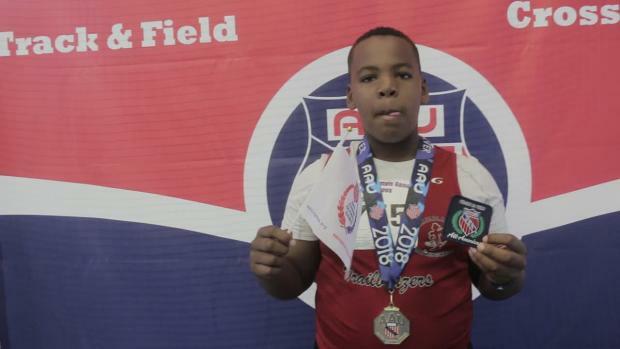 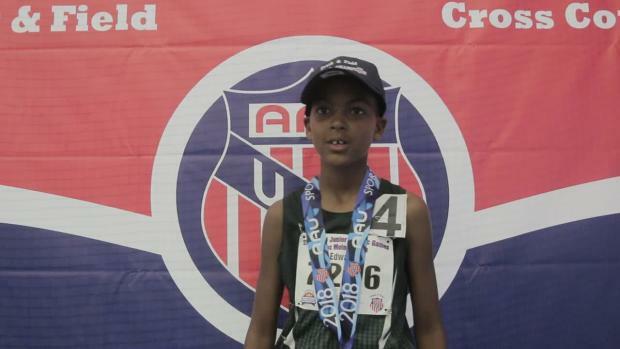 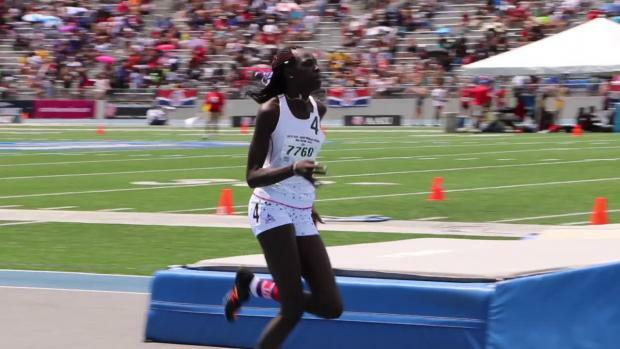 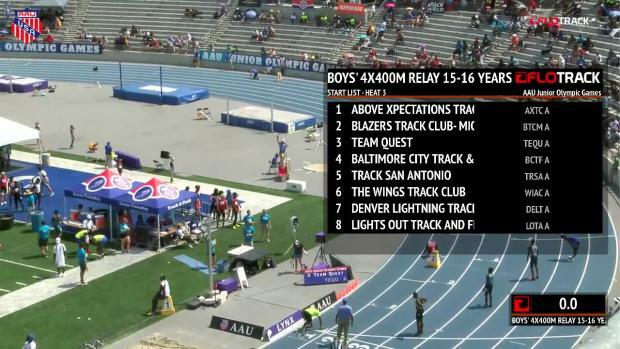 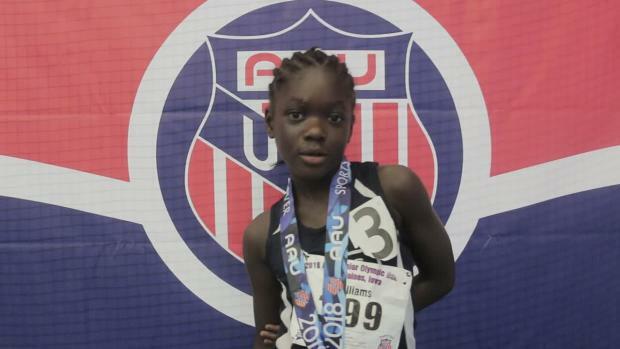 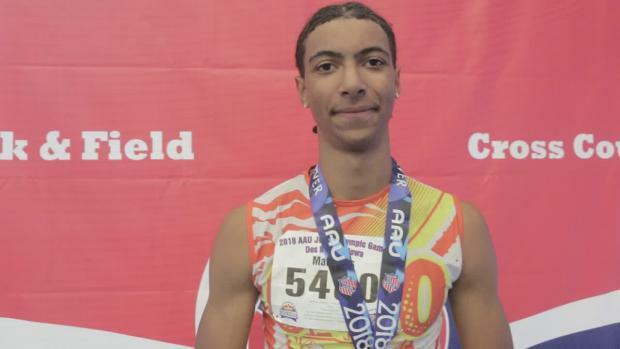 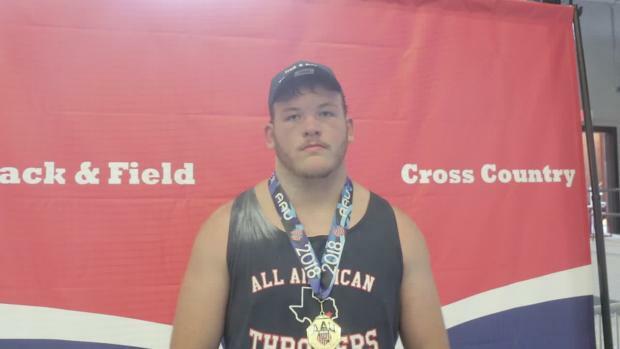 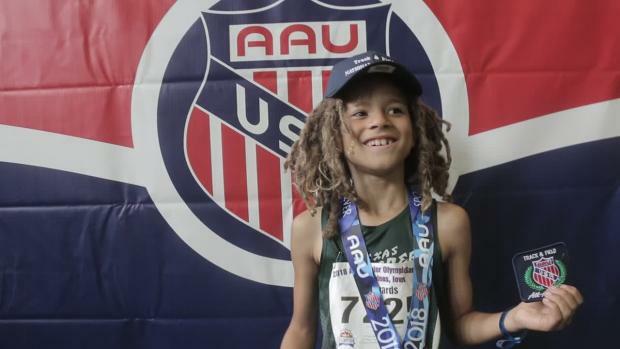 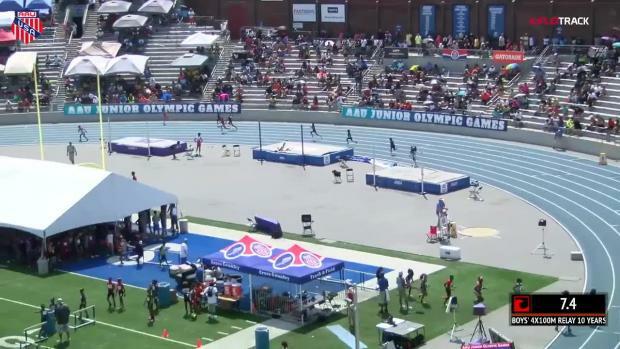 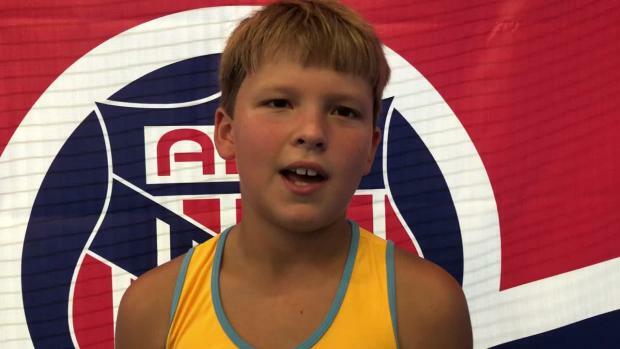 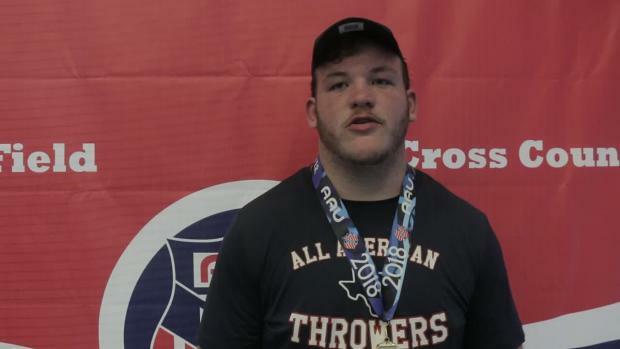 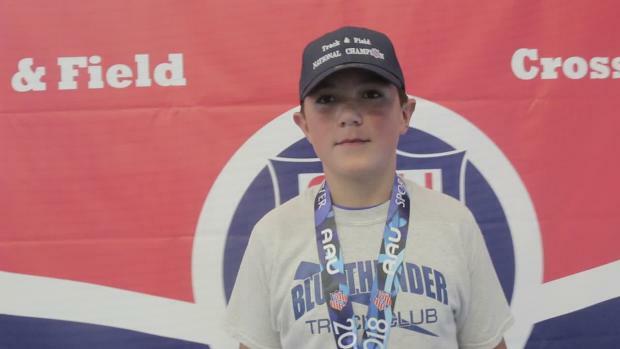 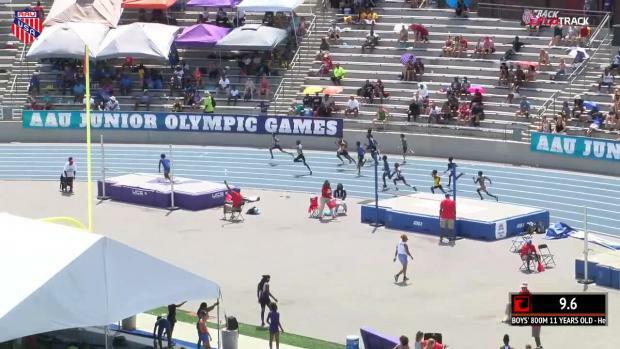 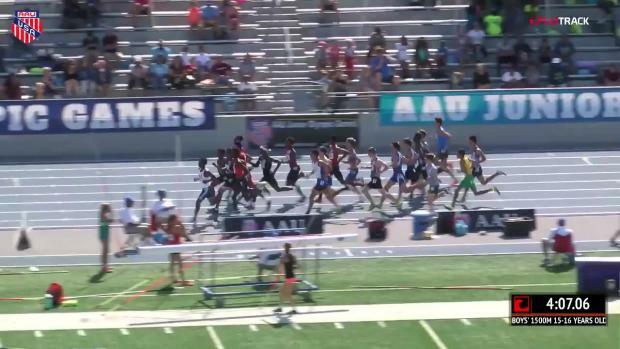 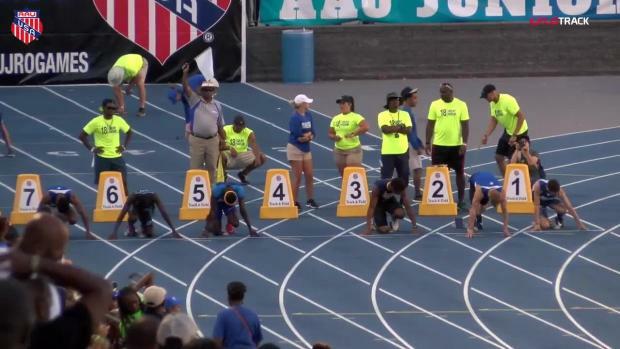 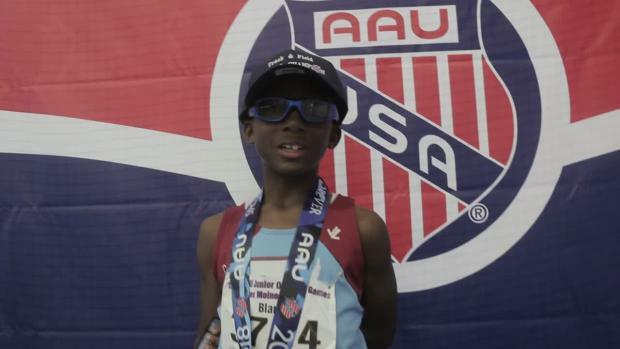 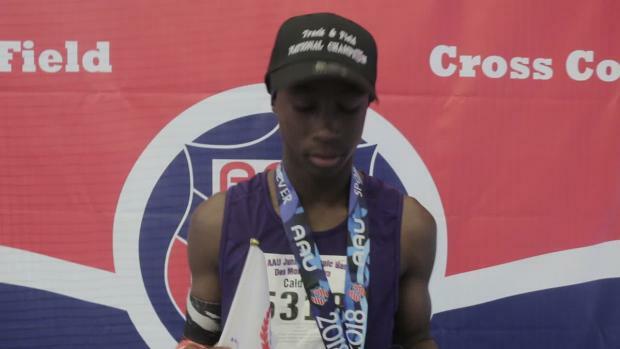 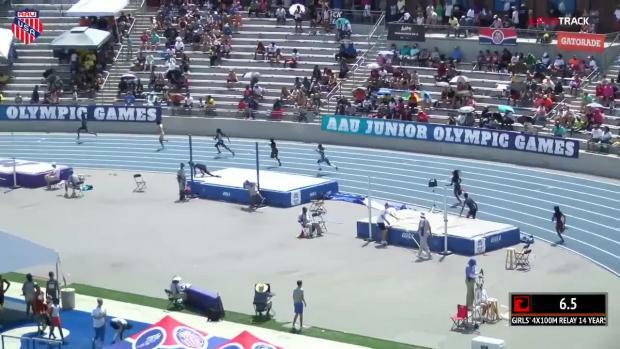 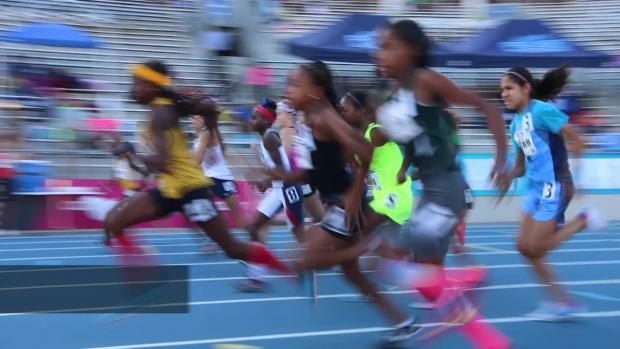 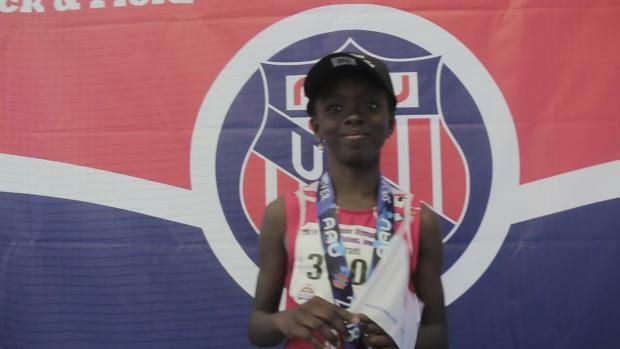 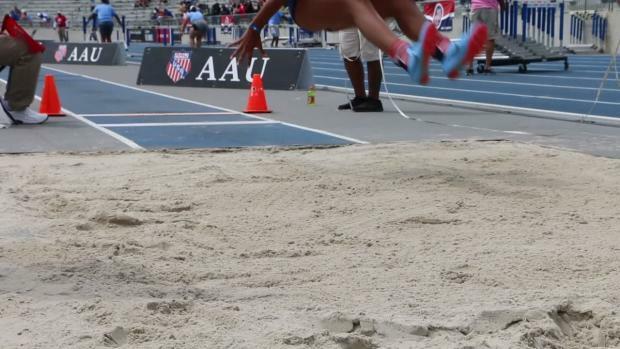 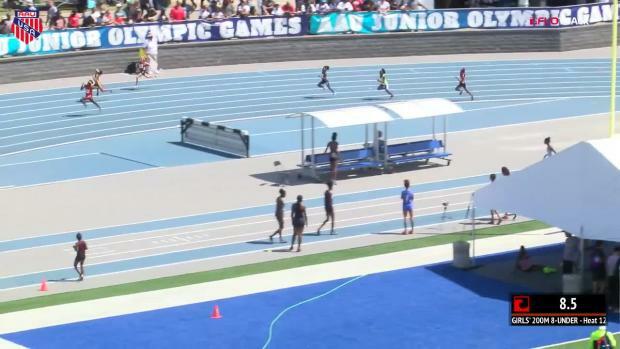 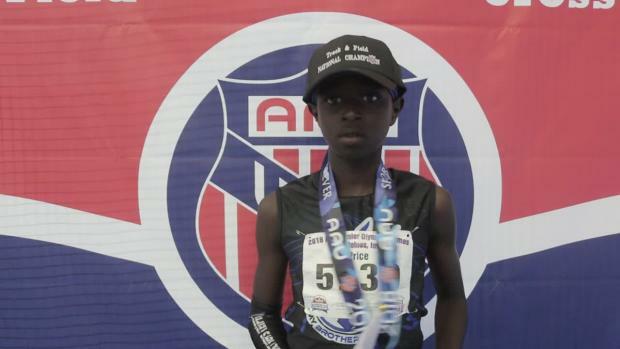 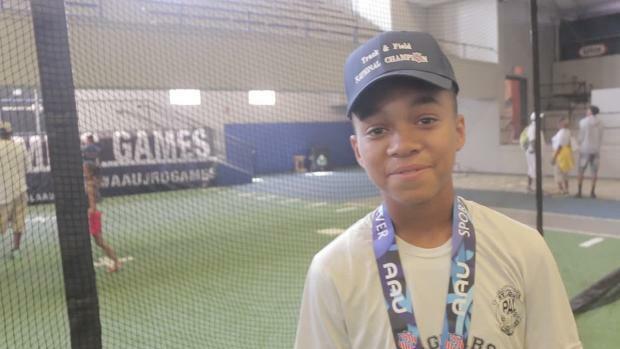 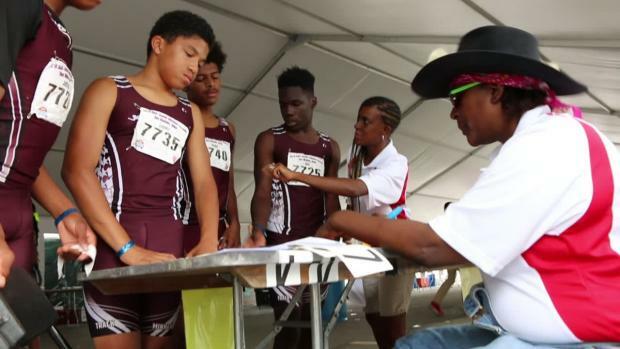 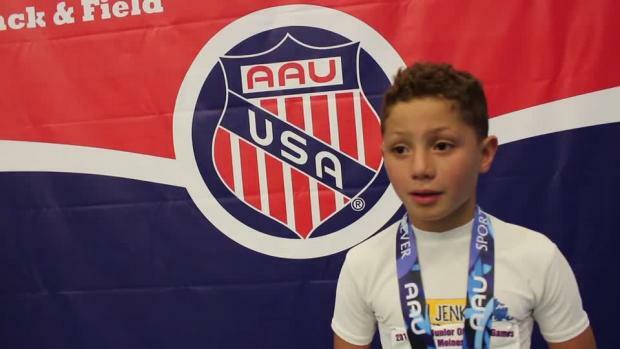 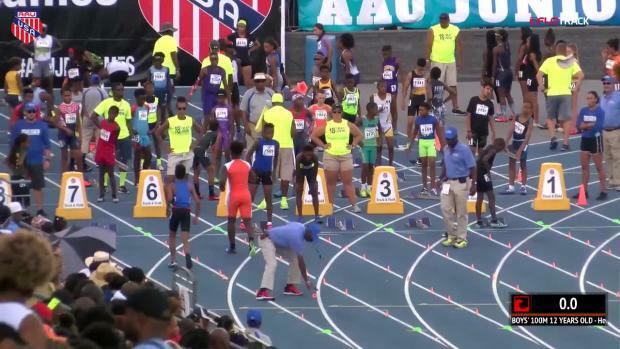 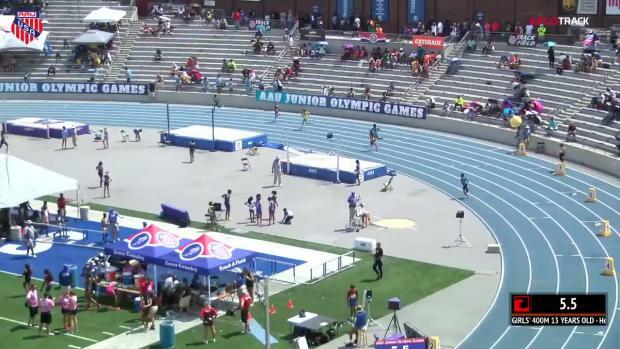 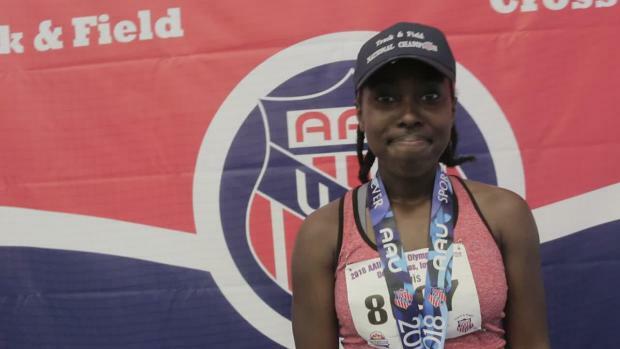 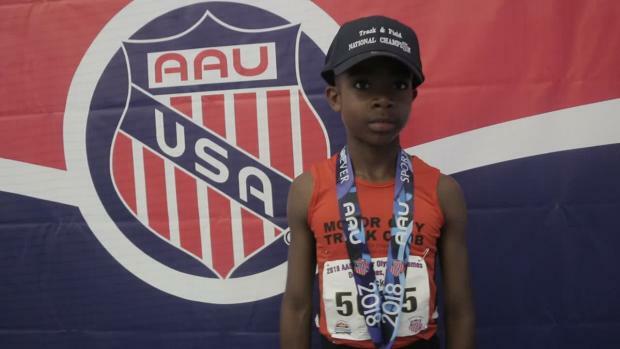 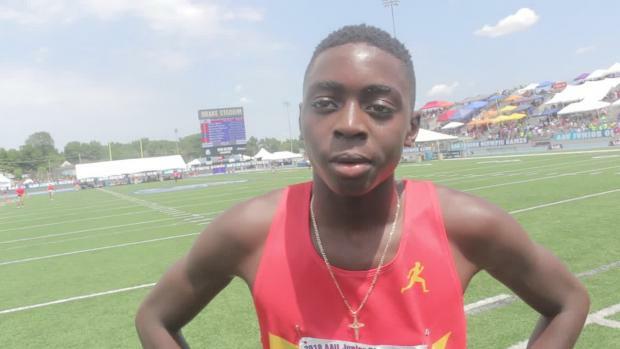 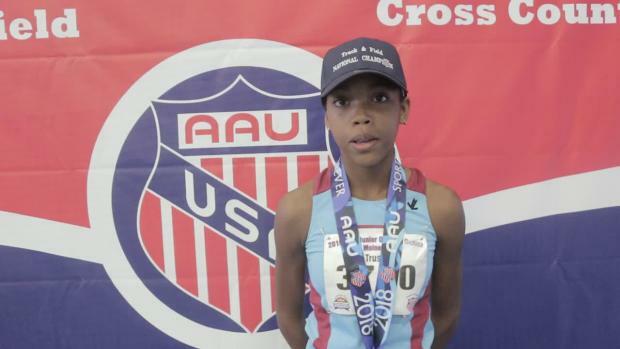 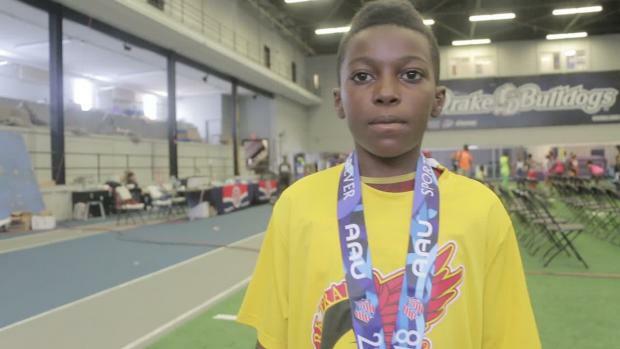 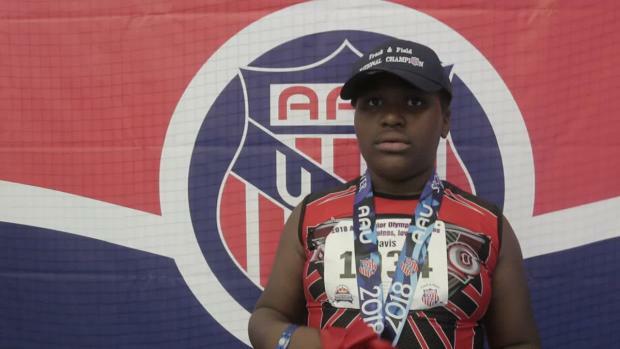 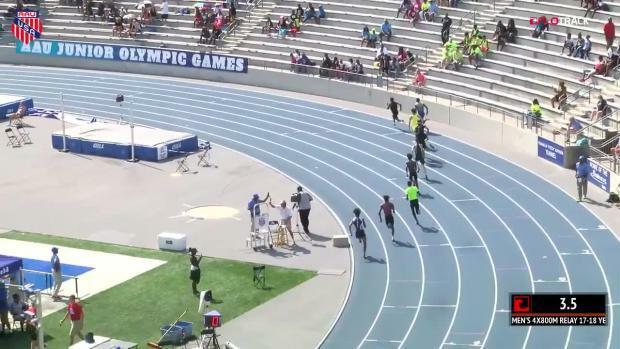 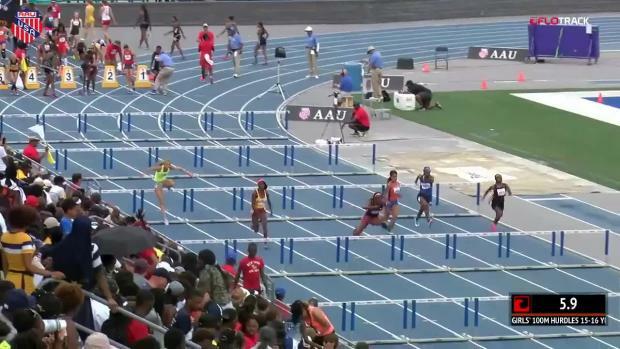 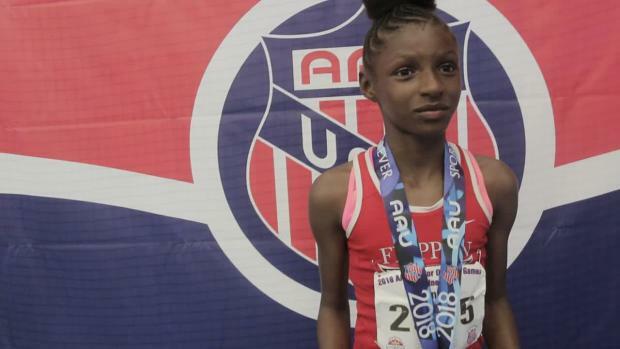 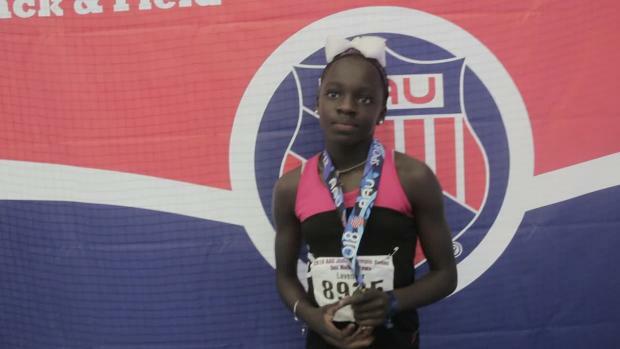 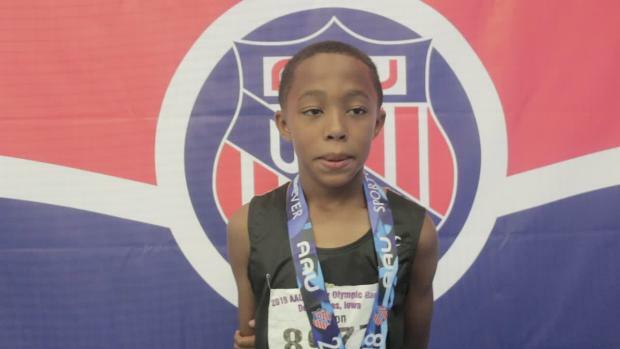 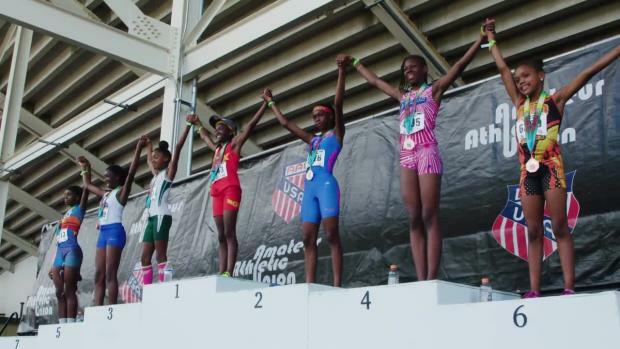 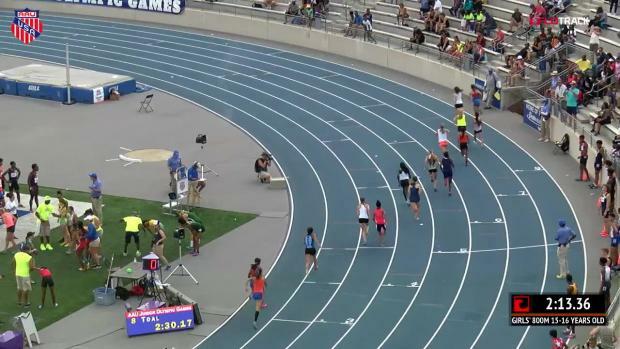 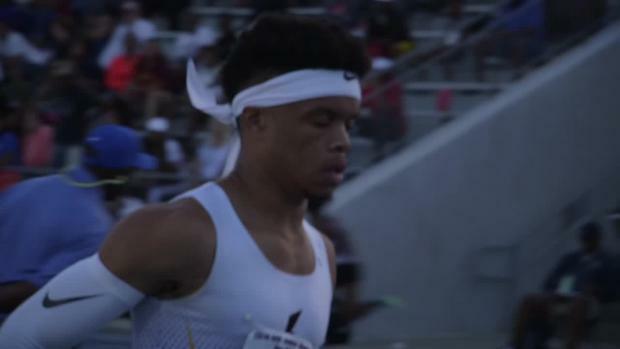 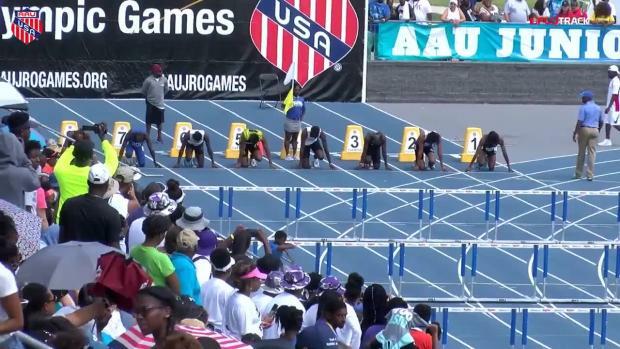 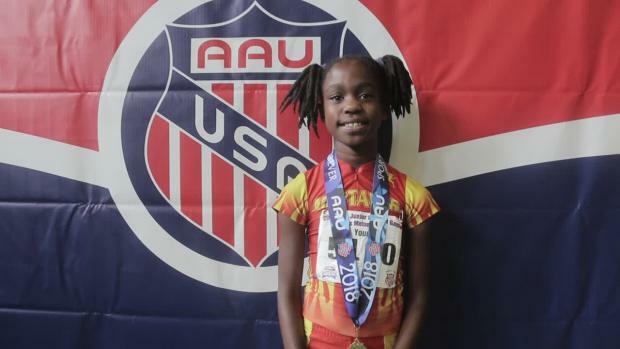 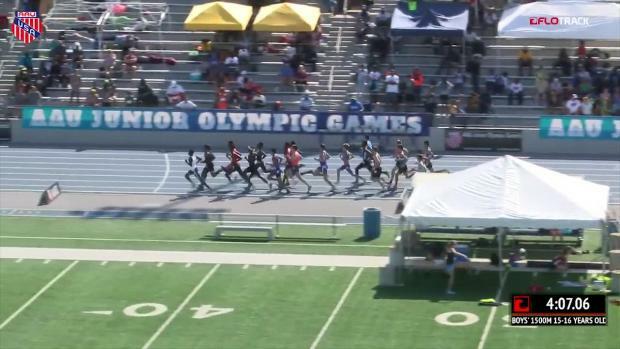 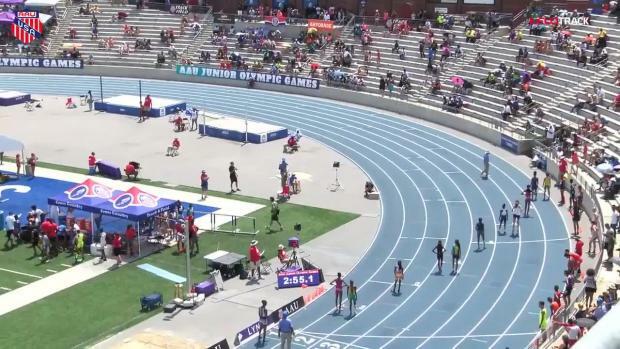 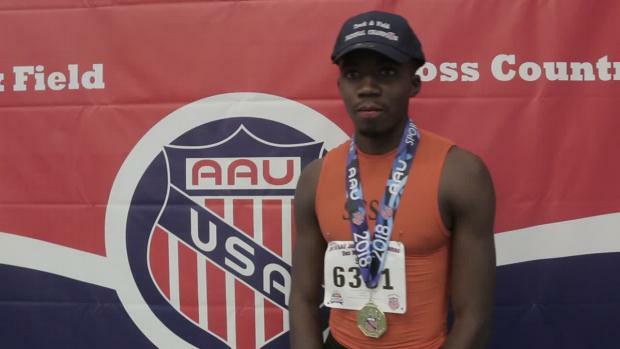 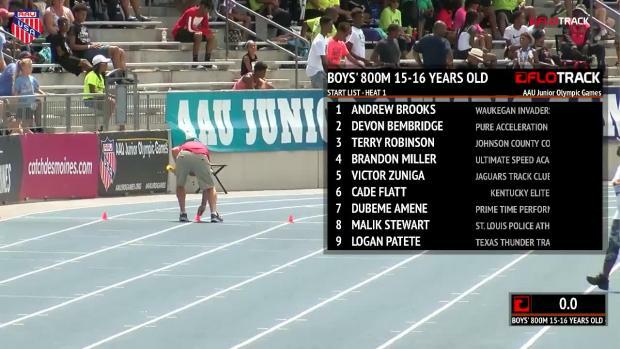 Check out highlights from the AAU Junior Olympics multi-events. 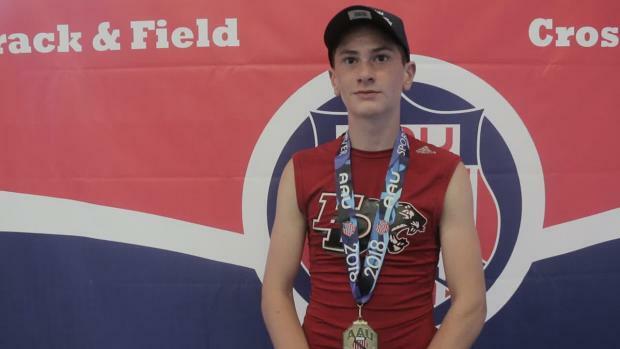 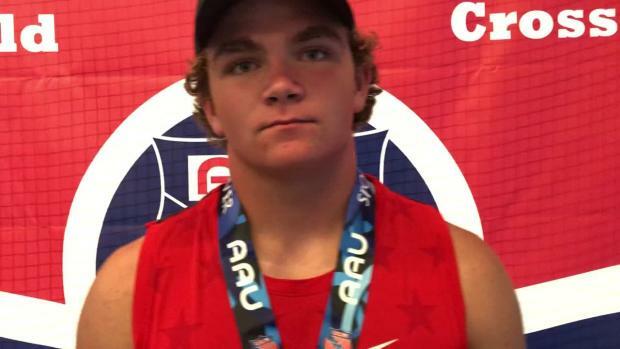 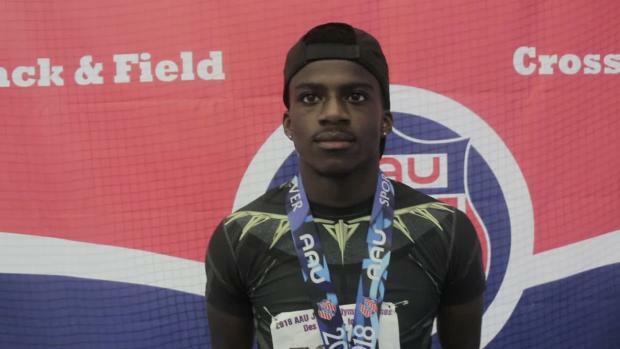 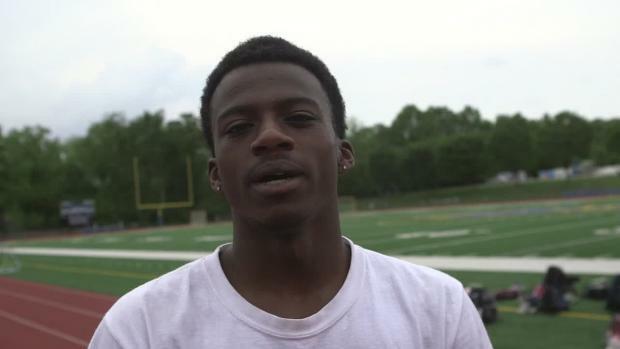 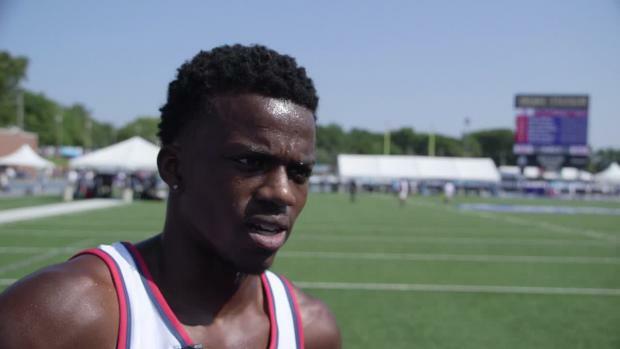 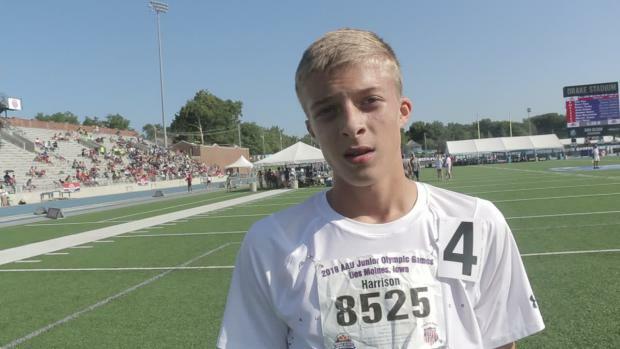 The Ohio Heat's Zac Robinson is in search of fast 200m and 400m times at the AAU Junior Olympics in Des Moines, Iowa. 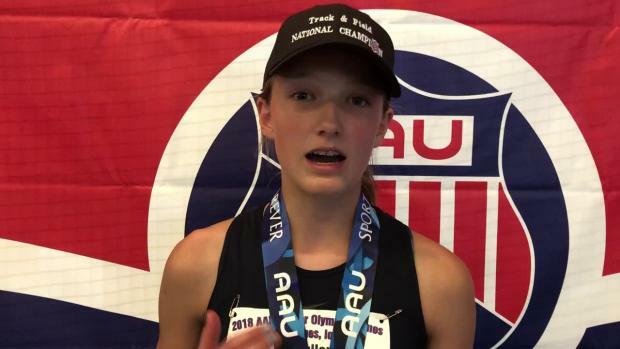 Maximum Output Track Club's Madison Eaton will look to post big results in the 100m hurdles, 400m hurdles and team relay events at the AAU Junior Olympic Games in Des Moines, Iowa. 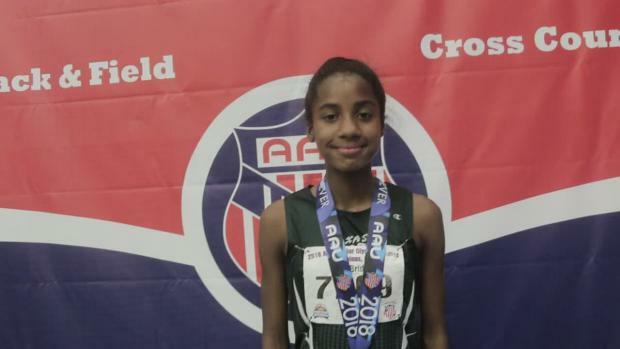 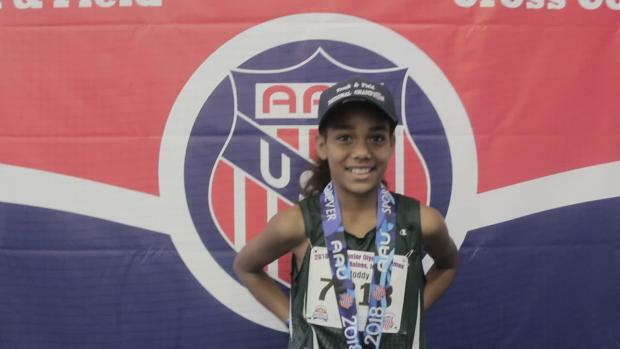 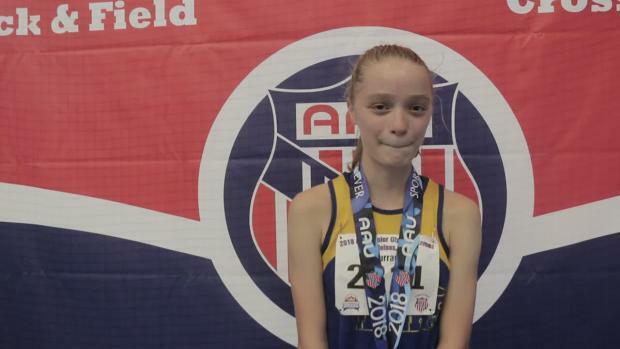 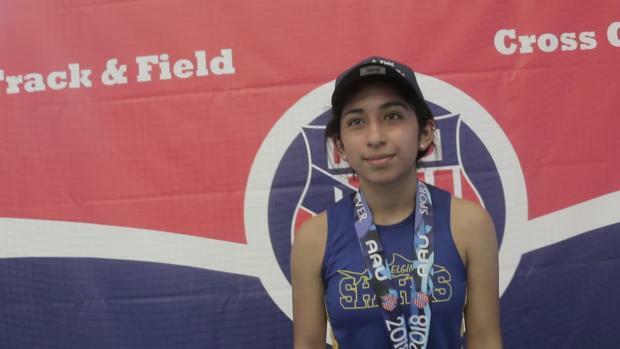 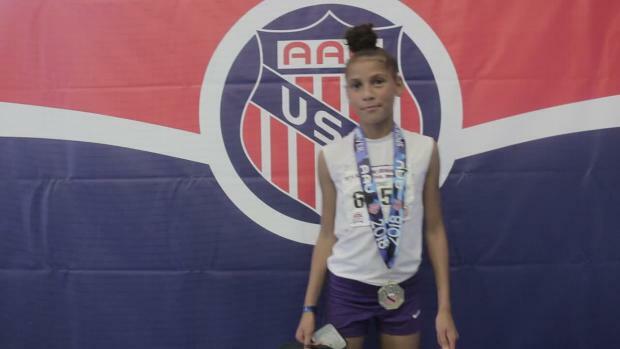 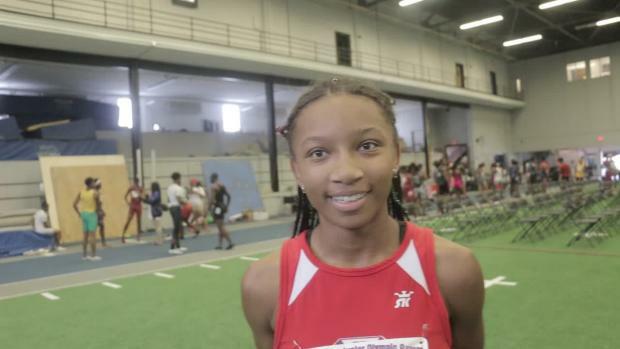 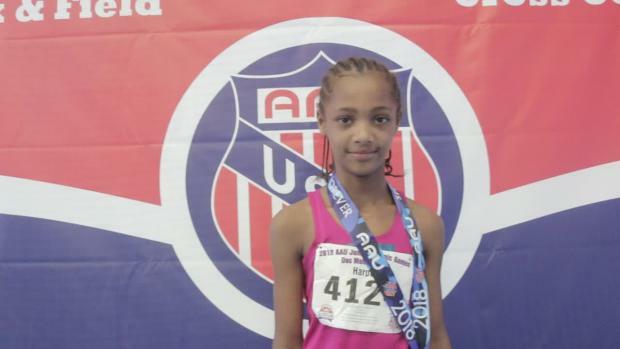 Southfield, Michigan's Kylee Turner recorded an impressive time of 10:39.85 to win the 3000m race in the 12 year old division. 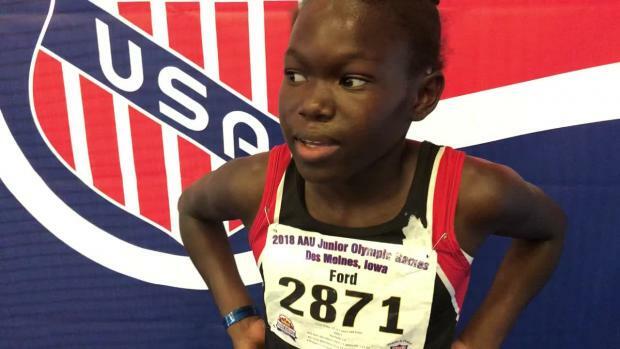 We've made it to Des Moines, Iowa for the 2018 AAU Junior Olympic Games. 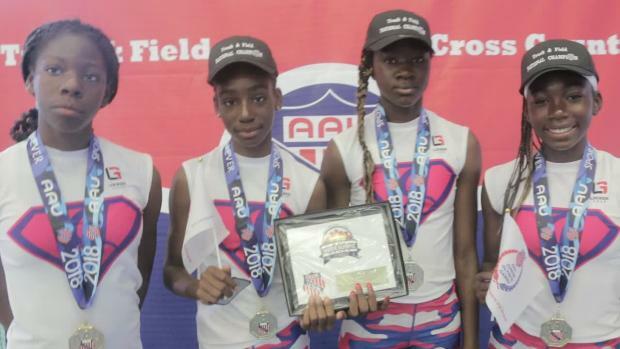 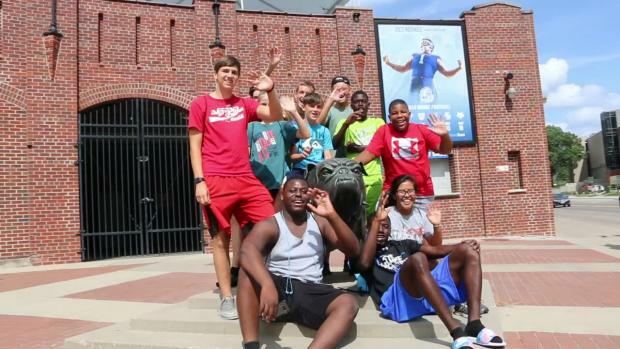 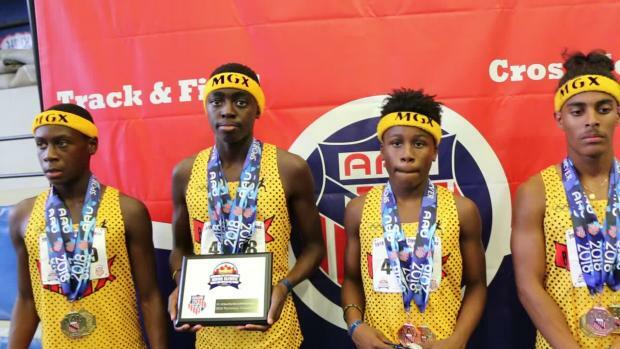 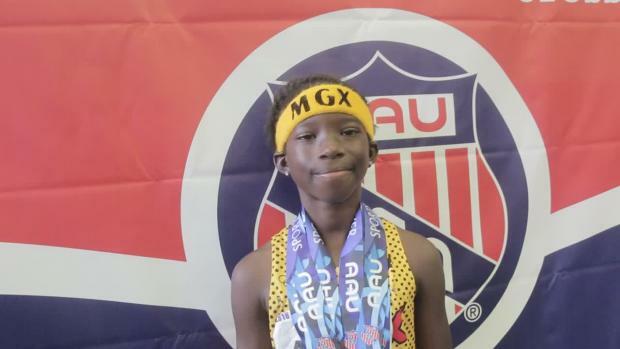 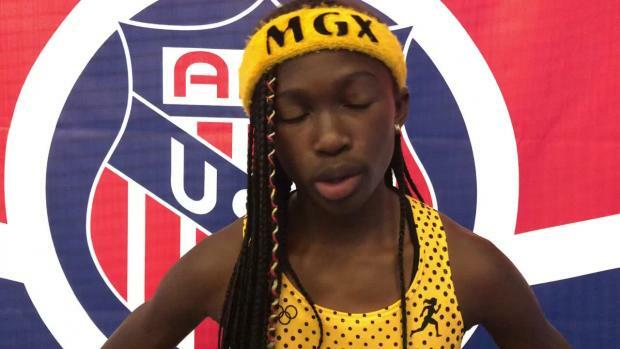 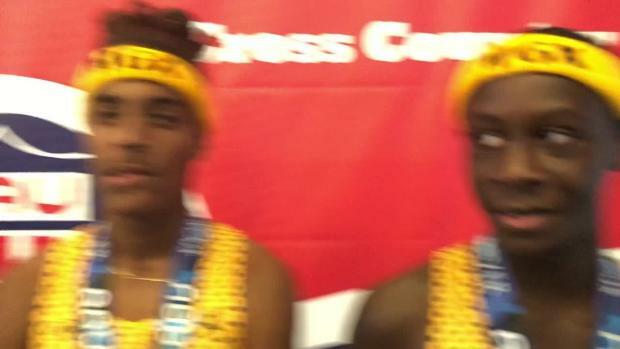 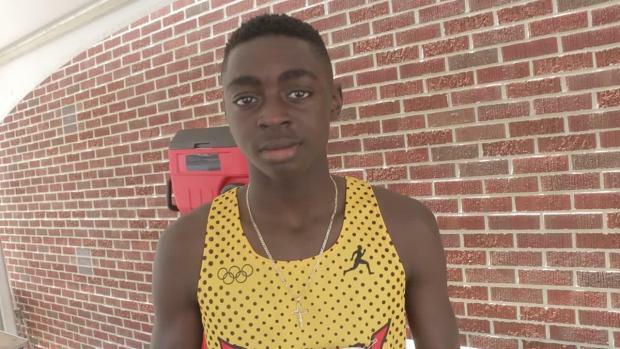 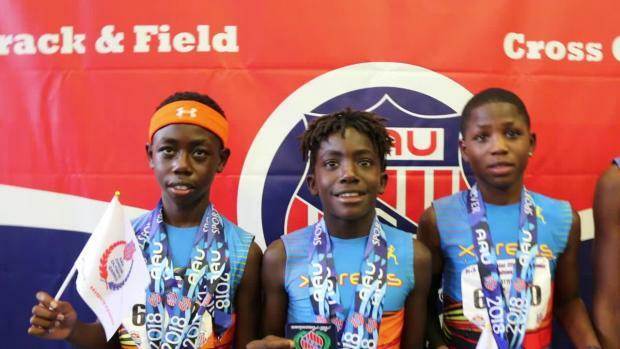 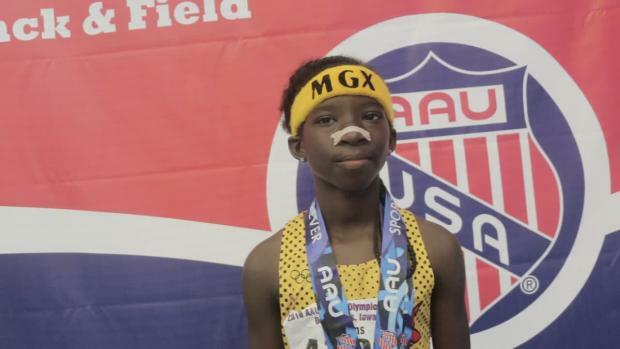 Miami Gardens Express Track Club is ready to take on the AAU Junior Olympics. 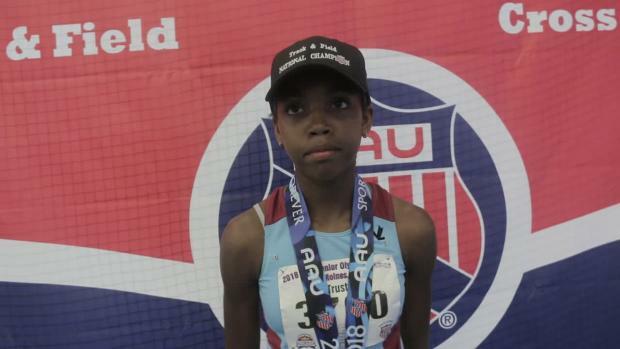 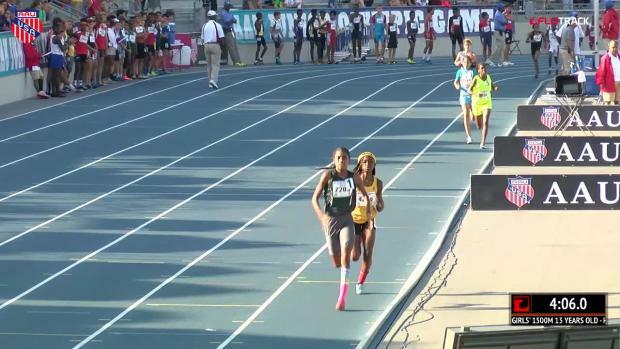 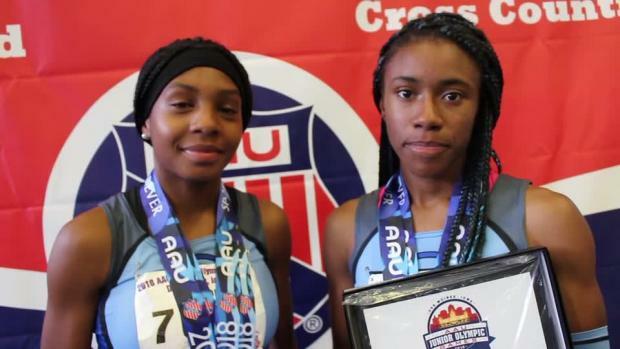 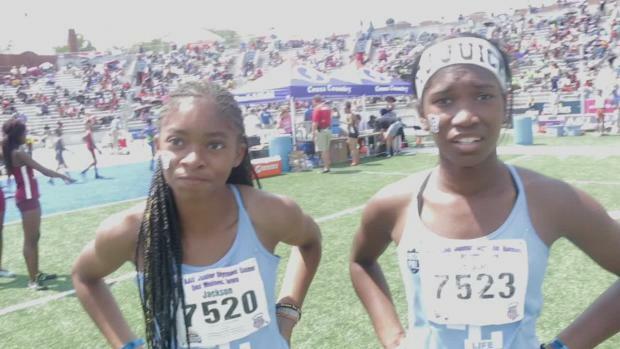 Krianne McBride and Cha'iel Johnson had an epic 1500m matchup in the 13-year-old girls 1500m. 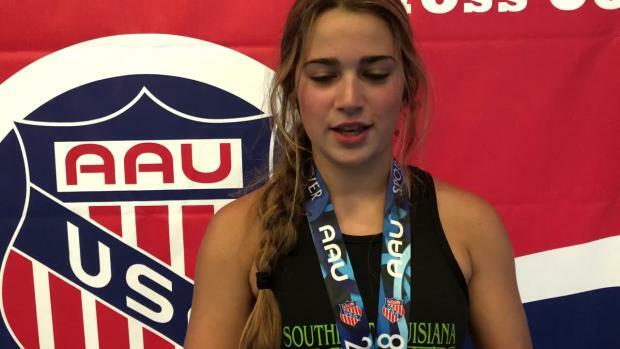 AAU Junior Olympic Games celebrity host Libby Vincek from 'Survivor: Ghost Island' helps MileSplit ask AAU Junior Olympic Games fans trivia questions. 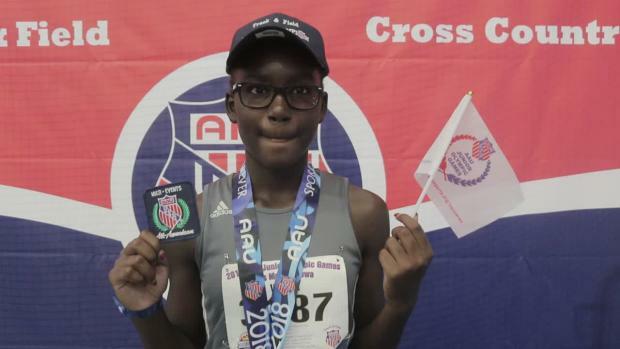 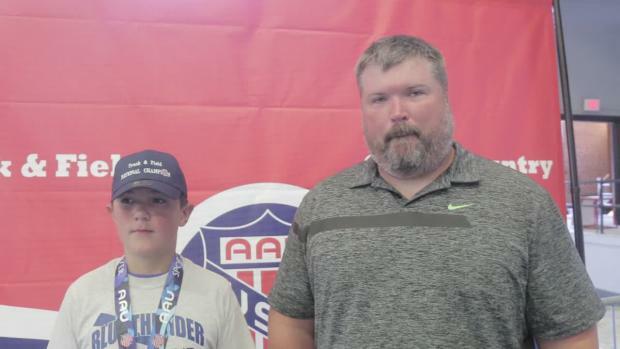 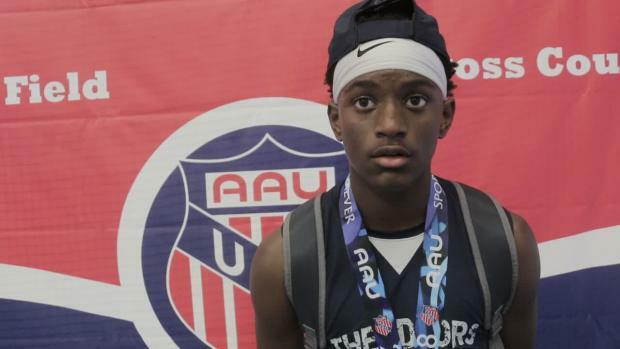 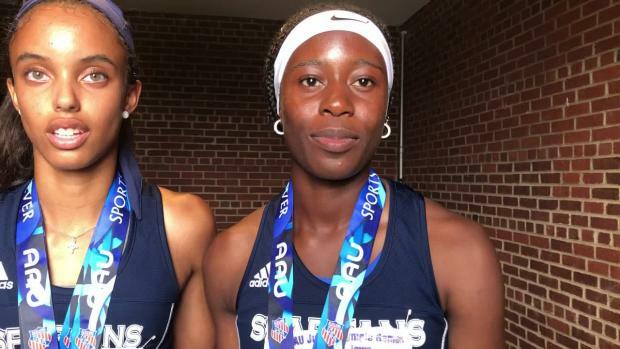 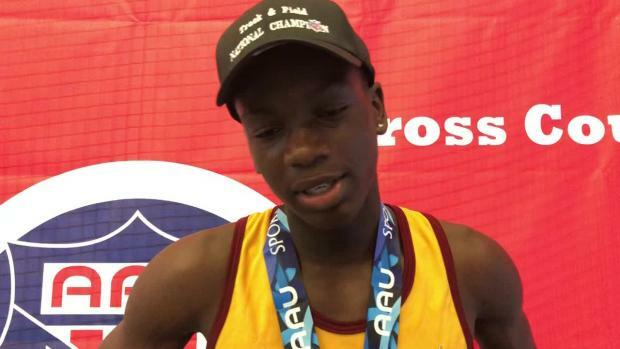 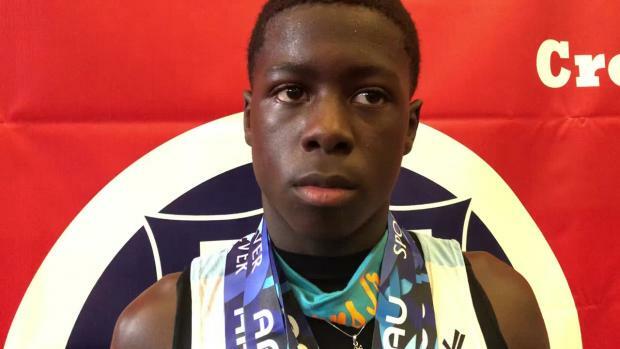 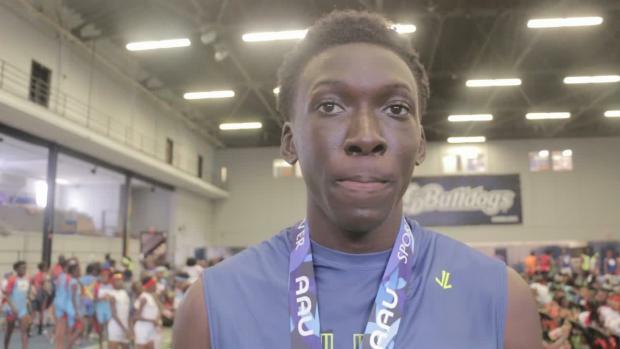 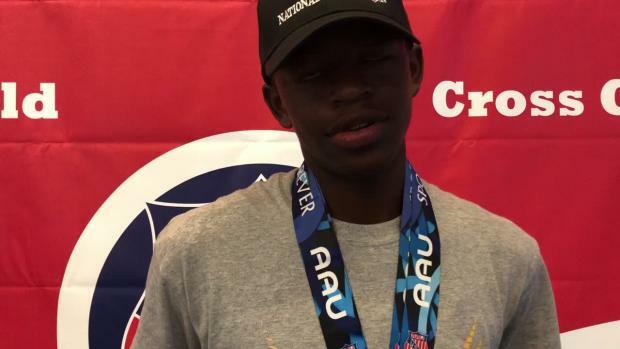 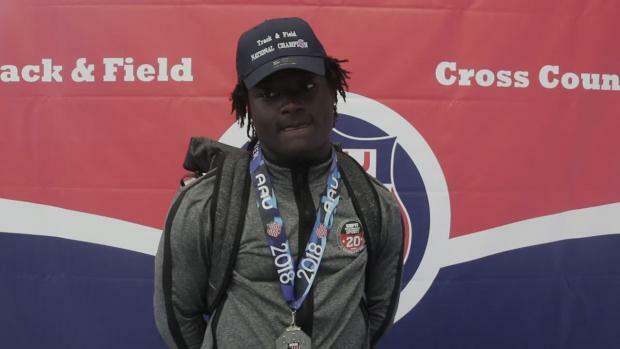 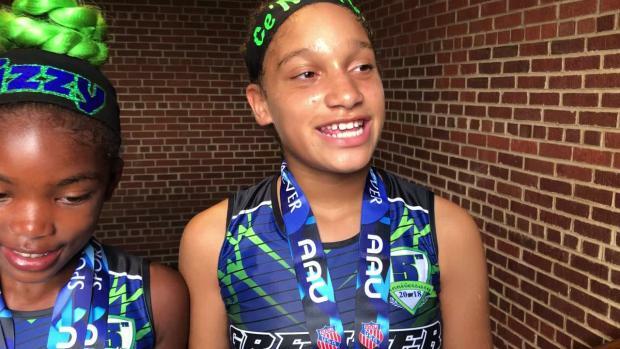 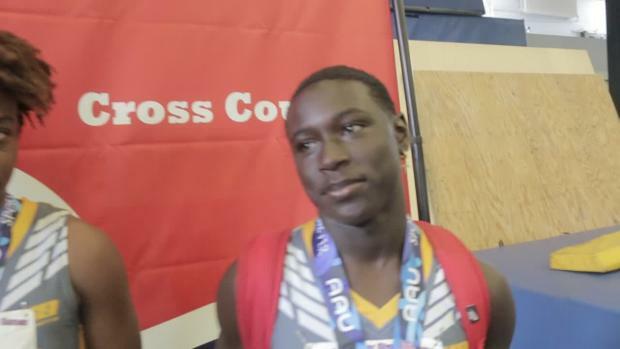 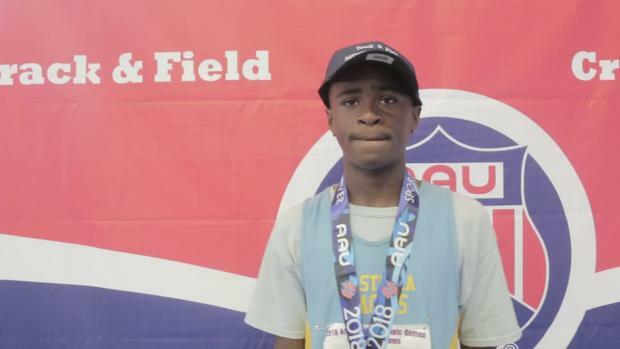 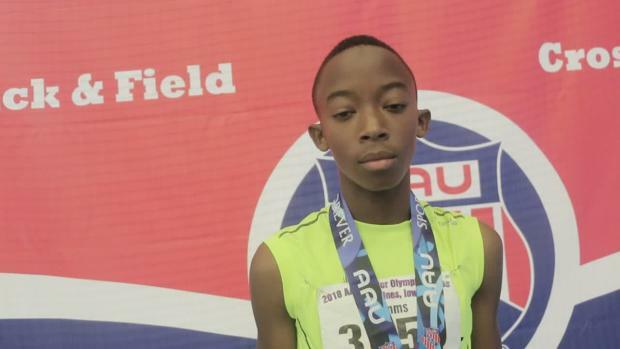 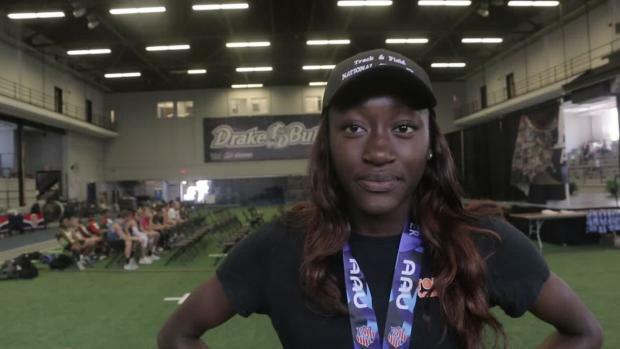 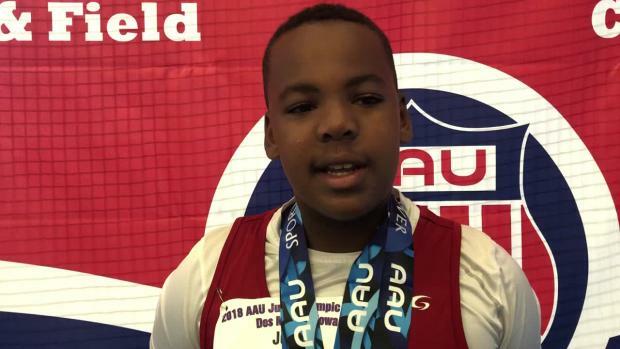 We followed athletes from check in to the awards stand to take in the sights and sounds of championship Saturday at the AAU Junior Olympics.